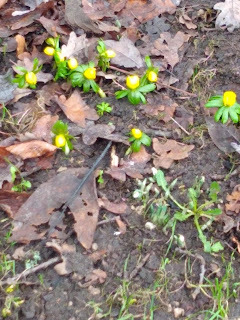 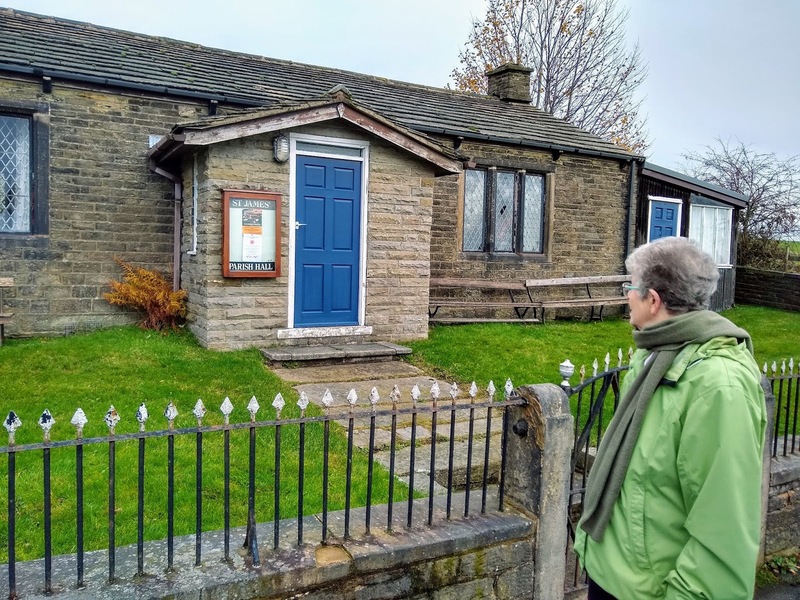 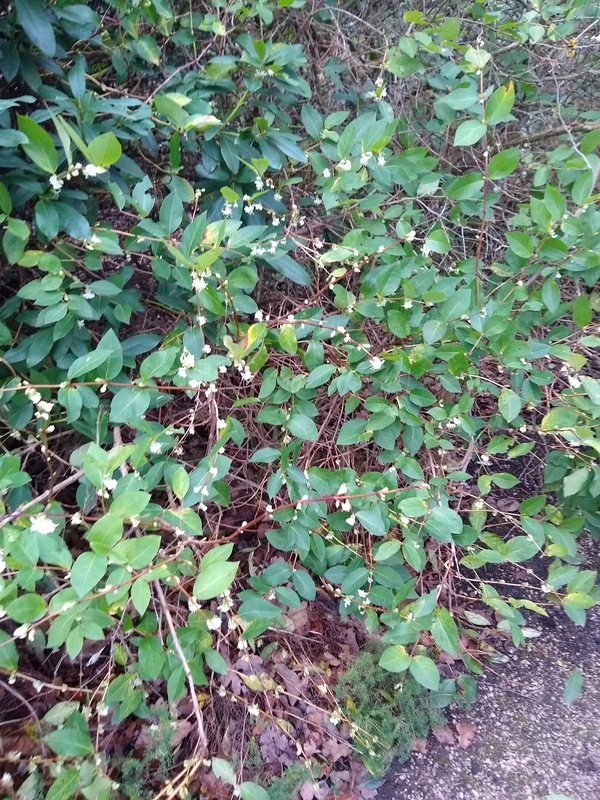 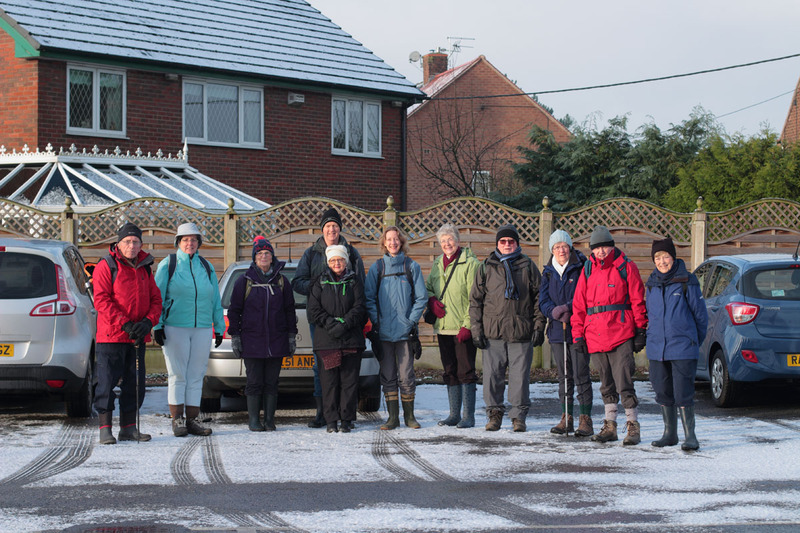 The Church Rambling Group meets on the second Saturday of each month (except Jan) at 9.30am on St. Paul's Rd outside the church. You do not have to be a church member to join our group and everyone will be very welcome to come along on the walk. 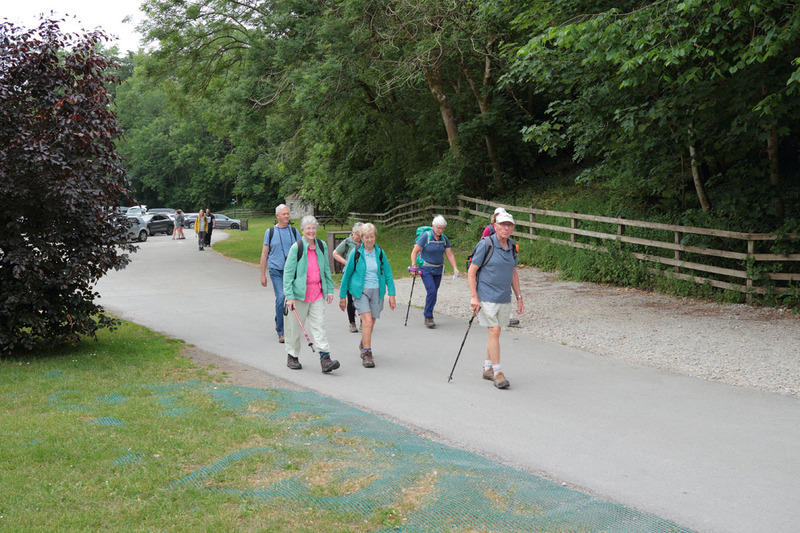 A lift to the starting point will be available for those without a car. 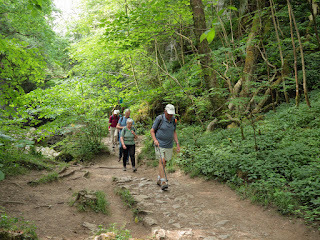 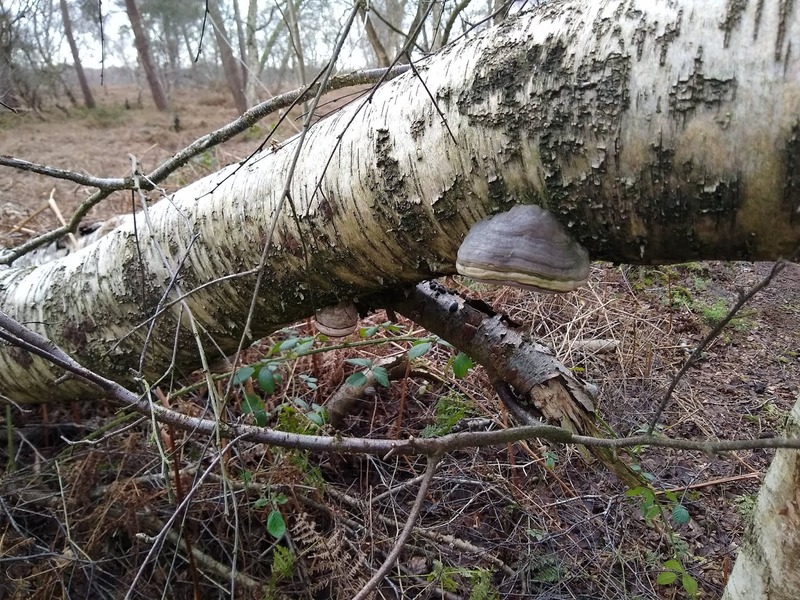 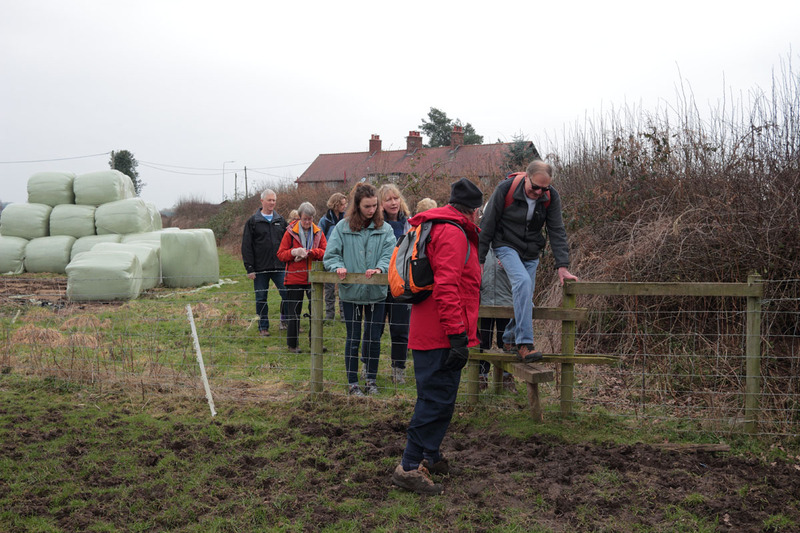 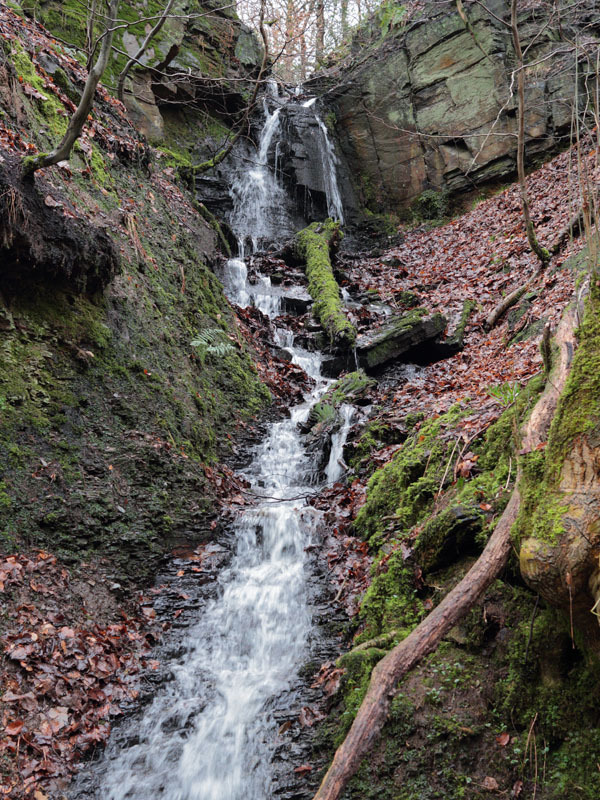 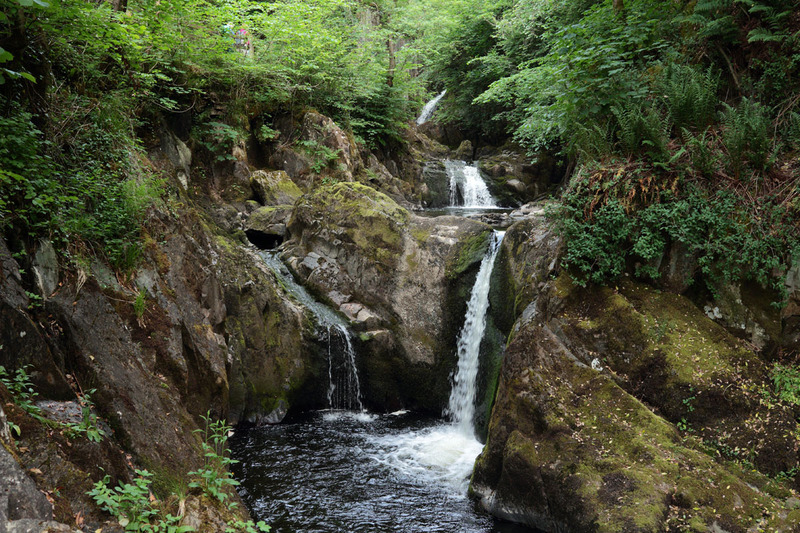 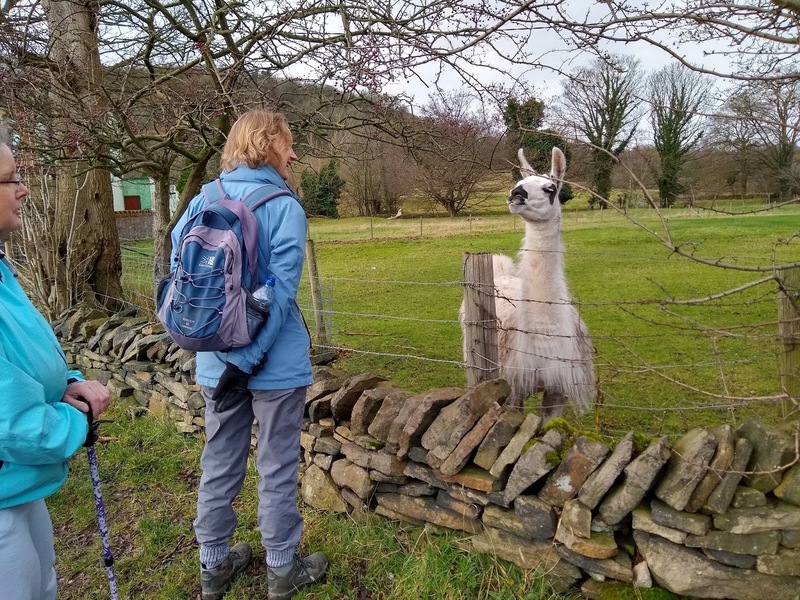 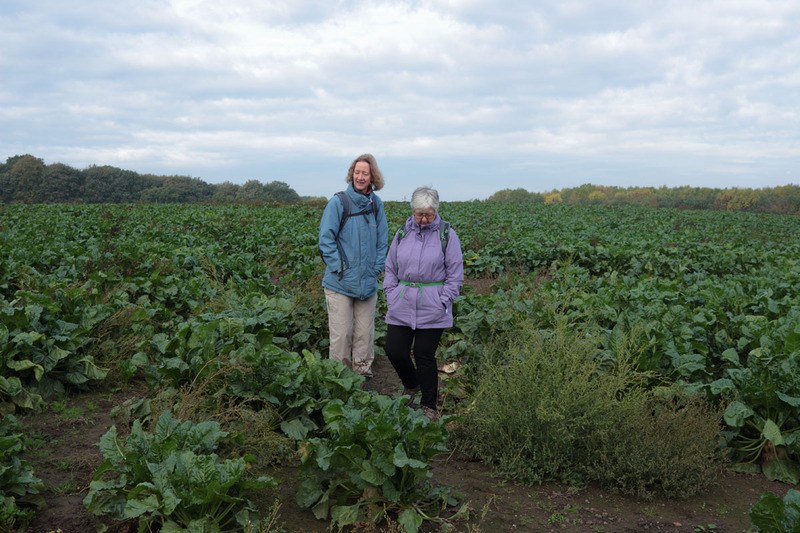 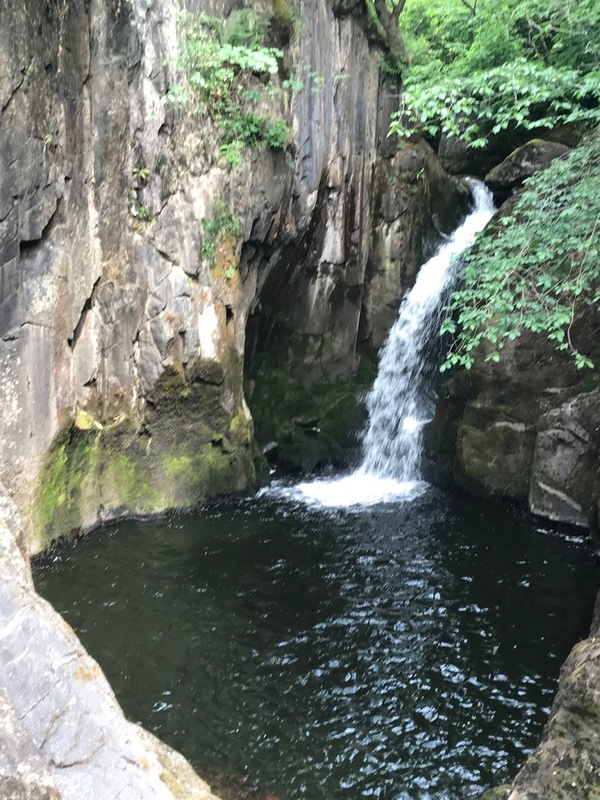 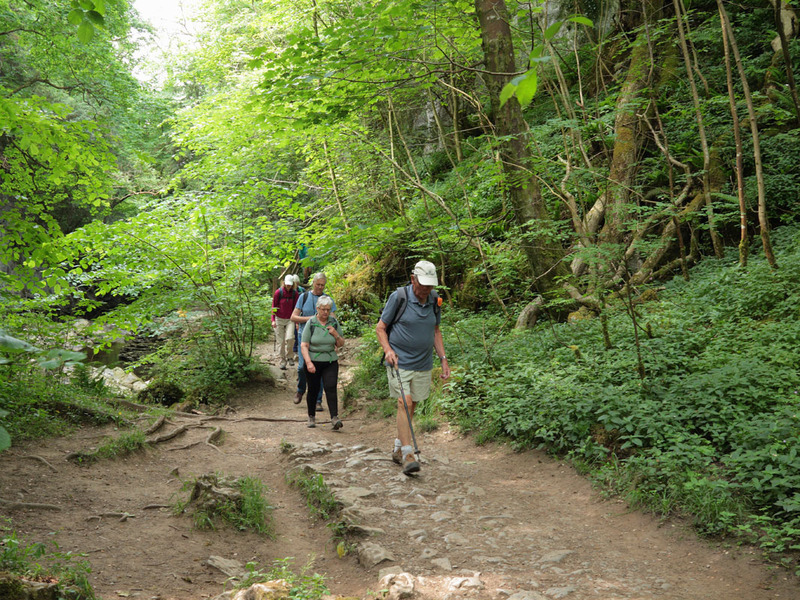 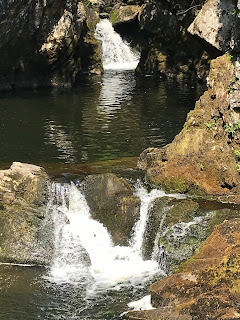 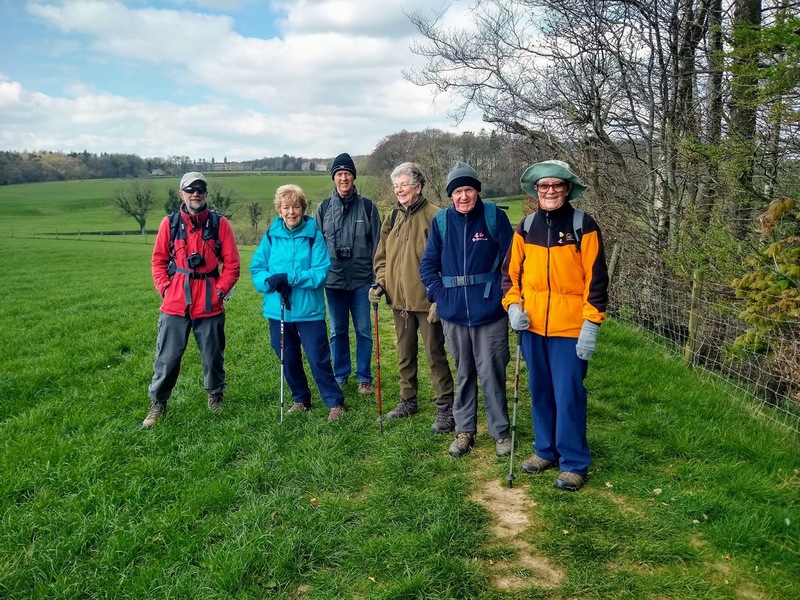 We have an interesting programme of rambles - I would describe as easy to moderate - which vary in length between 4 and 8 miles and usually finish up with a pub lunch. 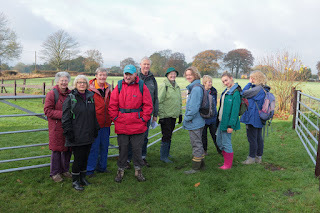 A party of eleven of us set off from the Shireburn Arms, Hurst Green to explore the Tolkien Trail in the Ribble Valley. 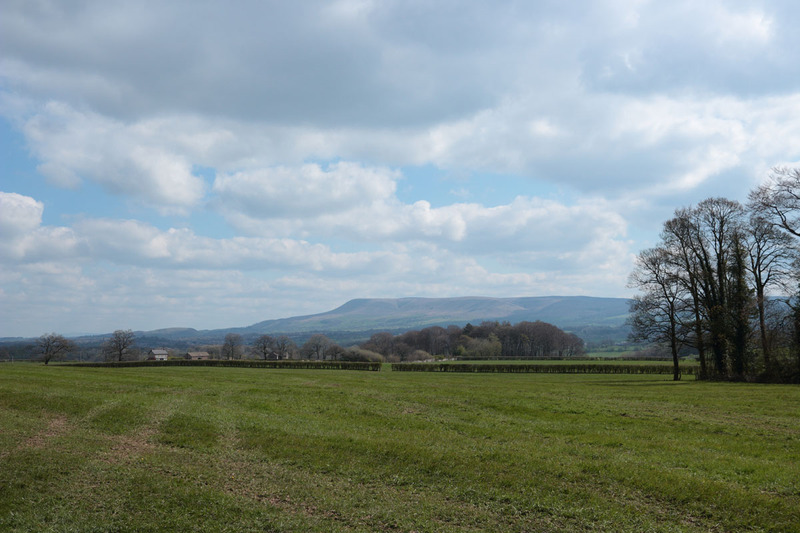 The first leg of the walk takes you across fields from which you have fine views of Pendle Hill and the surrounding countryside. 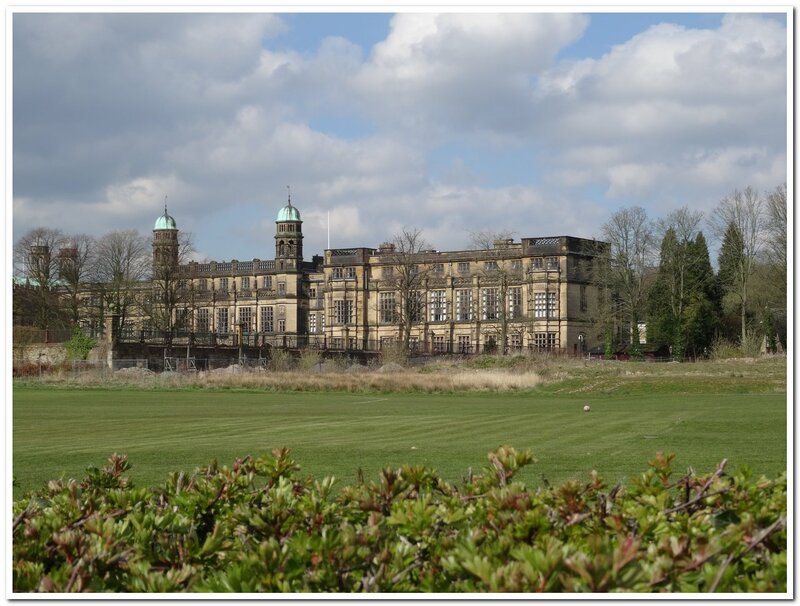 Eventually we reached Stonyhurst College the Jesuit School with it's fine Grade 1 listed buildings. 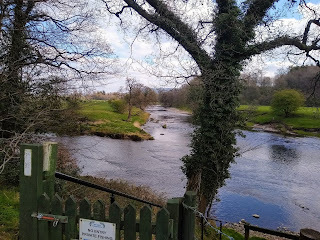 From here we made the descent into the Ribble Valley passing Cromwell's Bridge over the River Hodder and named after him when he marched his army across on the way to Walton-le-Dale to fight the Battle of Preston in 1648. 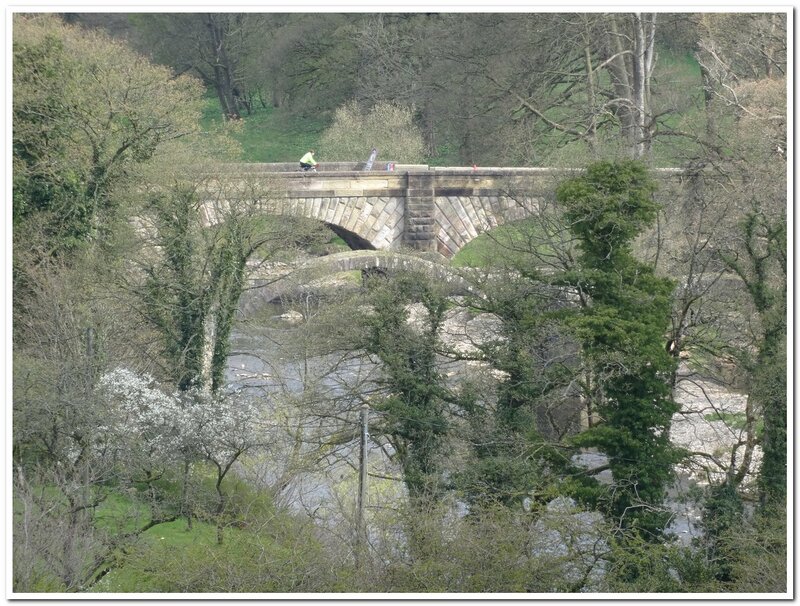 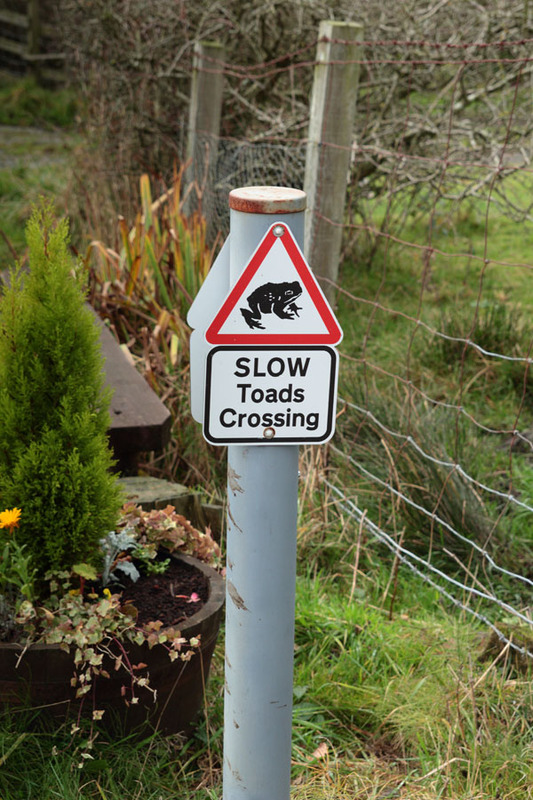 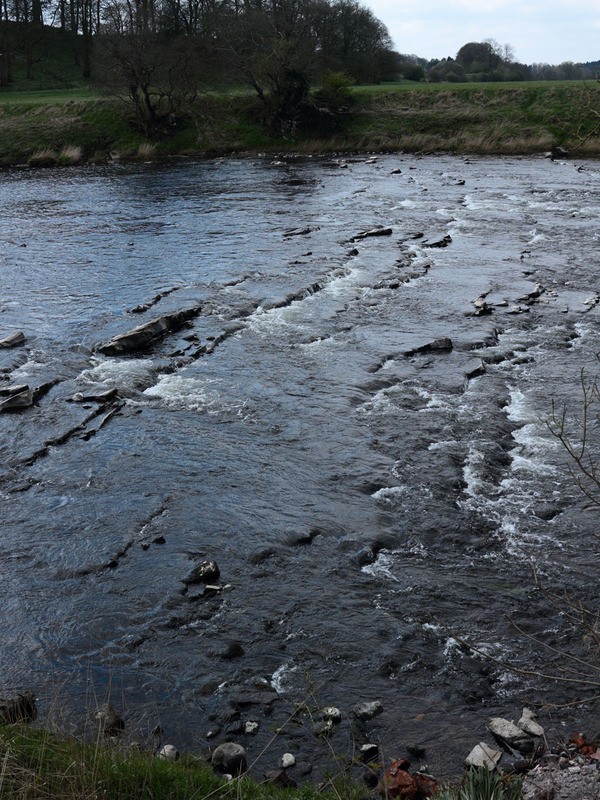 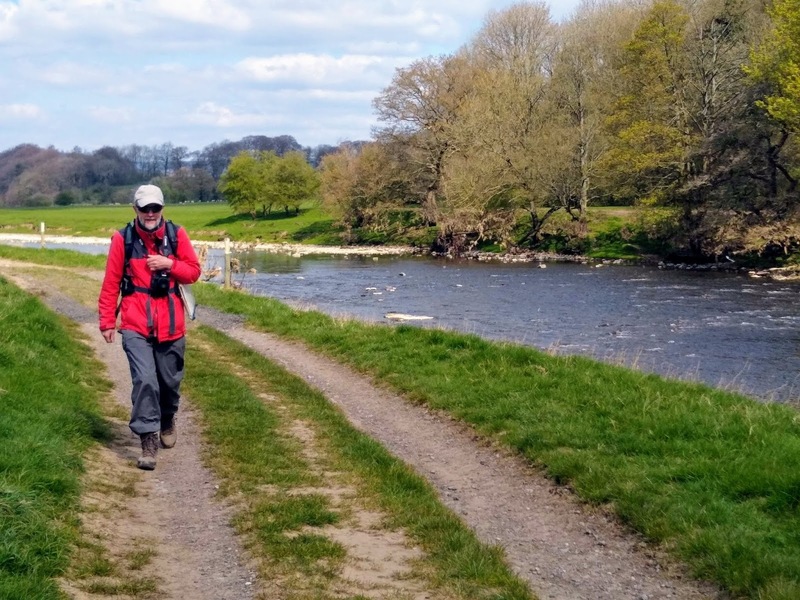 The route then leaves the river and follows farm tracks to reach the River Ribble at the junction of the two rivers. The path continues along the banks of the Ribble undulating through the beautiful Lancashire countryside. On the way you pass the Jumbles where the river tumbles across the limestone ridge and the mysterious stone cross on the adjacent hillside, Finally you reach the graceful aqueduct which arches across the river. 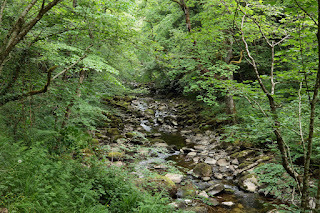 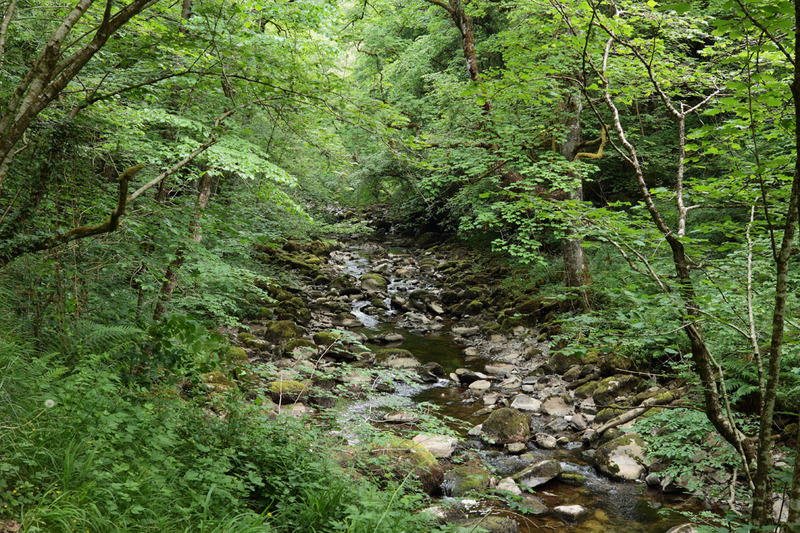 From here you make the climb from the river back to the pub where you can enjoy an excellent lunch in the old manor house and now the Shireburn Arms Hotel. The distance was about six miles. 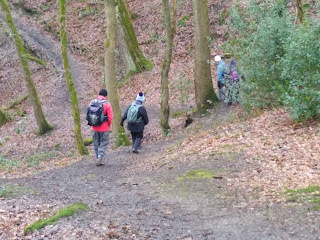 Steep climb back to the pub! 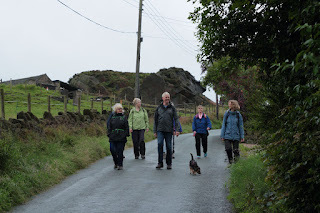 The walk started at the Grapes Inn, Bamford and the first leg took us across open fields at the rear of the pub and down to School Lane. 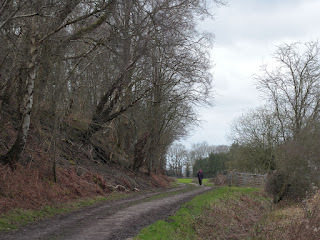 From here we entered Carr Wood at the old tea rooms. 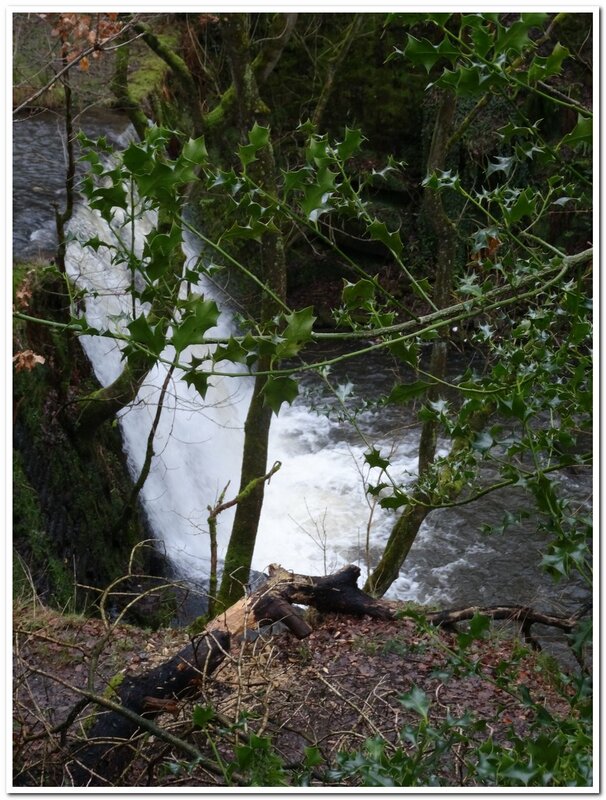 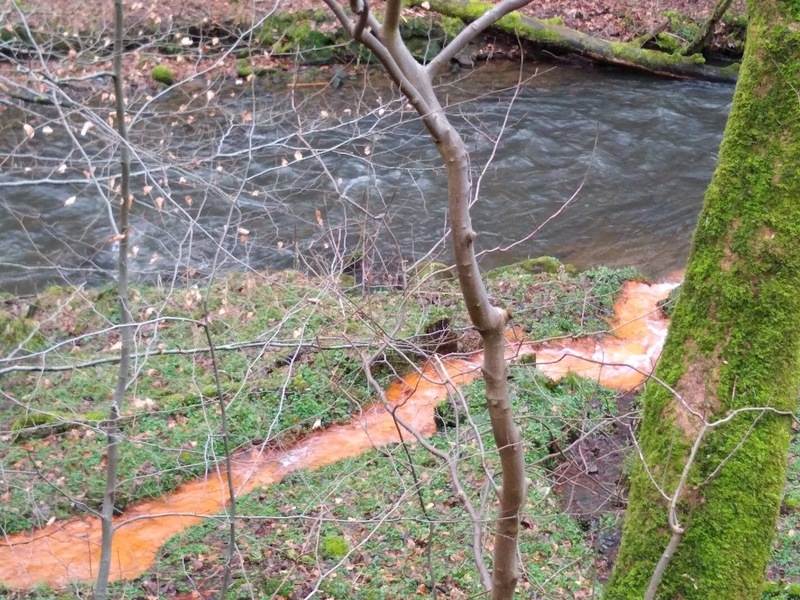 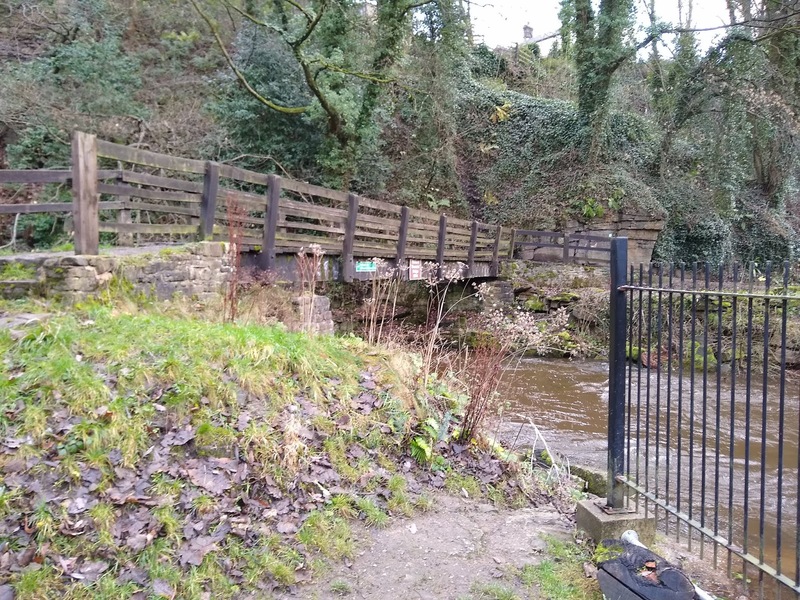 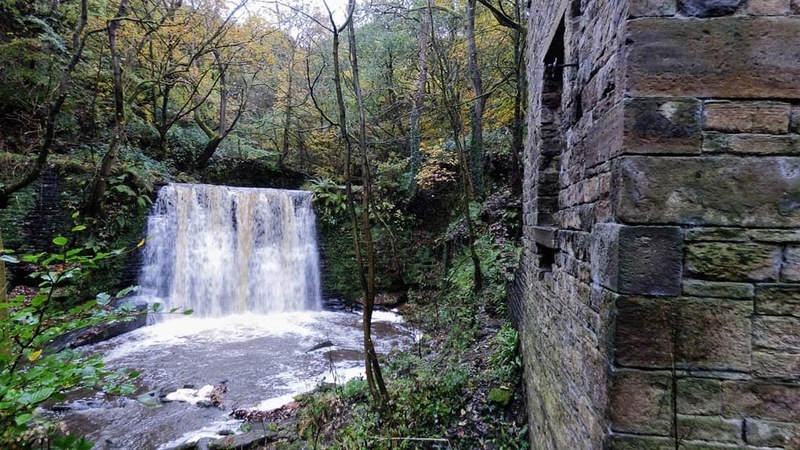 Plenty of interest to see with the weir and abandoned mill by Naden Brook. The path continues through this river valley which even in winter has a unique beauty. 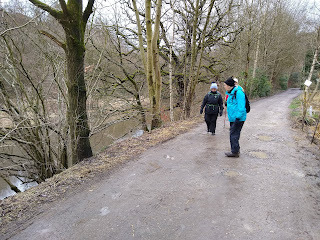 We continued downstream crossing the waterfall and the landslide, now made easy by the metal walkway, and eventually arrived at Simpson Clough. 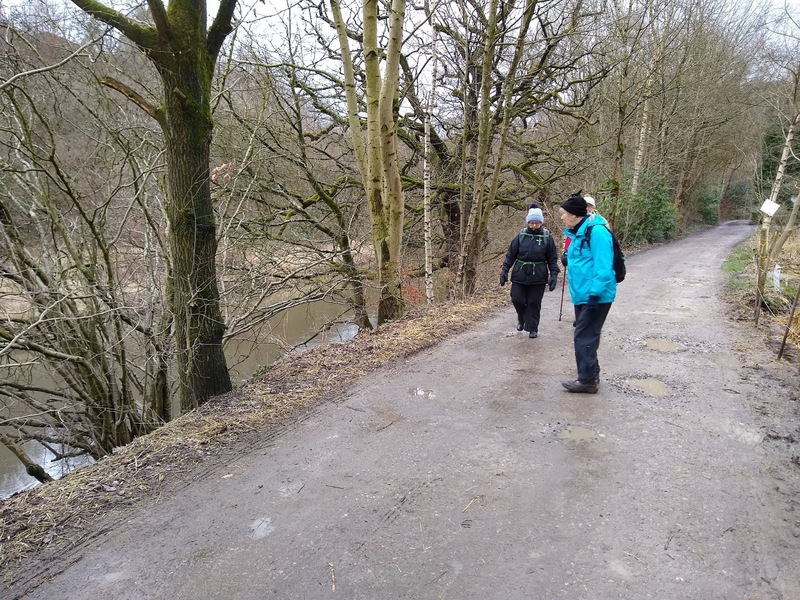 From here we followed Ashworth Road and then across Bury Road to join the foot path along the river Roch, After crossing Bamford Rd by the old Hooley Bridge Spinning Mill we again joined the path along the Roch until we reached the footbridge to take us into Queens Park in Heywood. At this time of year the herons take up residence in their nesting site on the island in the centre of the boating lake and we stopped for a coffee break with the expectation of seeing the birds in flight. 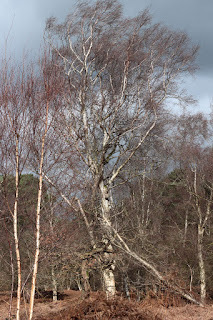 Unfortunately it was a very windy day and only three birds took to their wings. The remainder stayed in their nests and we could only observe them resting with the help of binoculars. 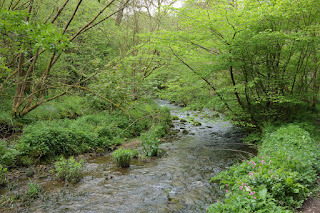 Refreshed by the break we continued past the cricket ground before crossing Millers Brook to again join the path along the Roch to Crimble Mill. 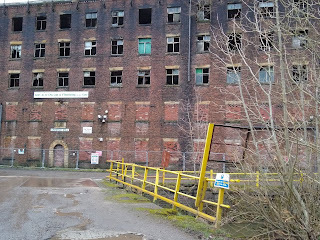 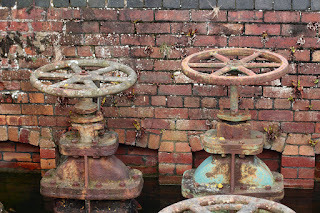 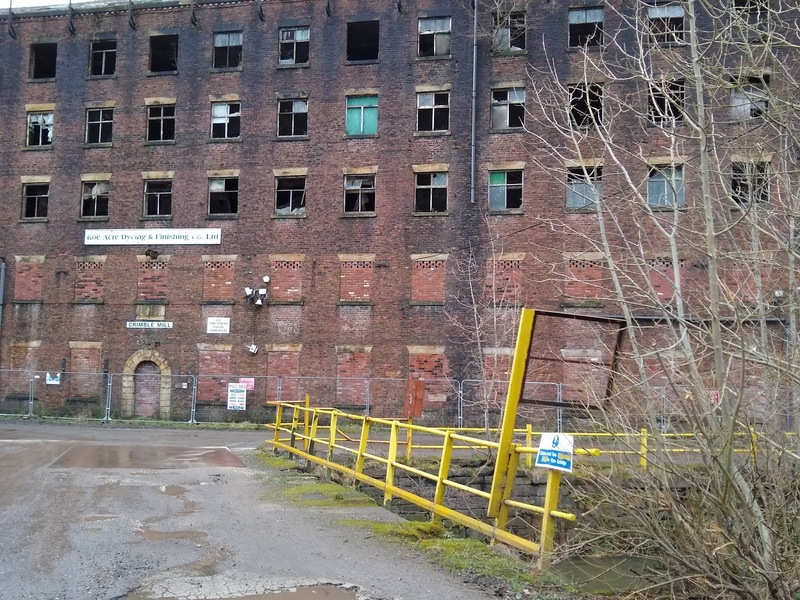 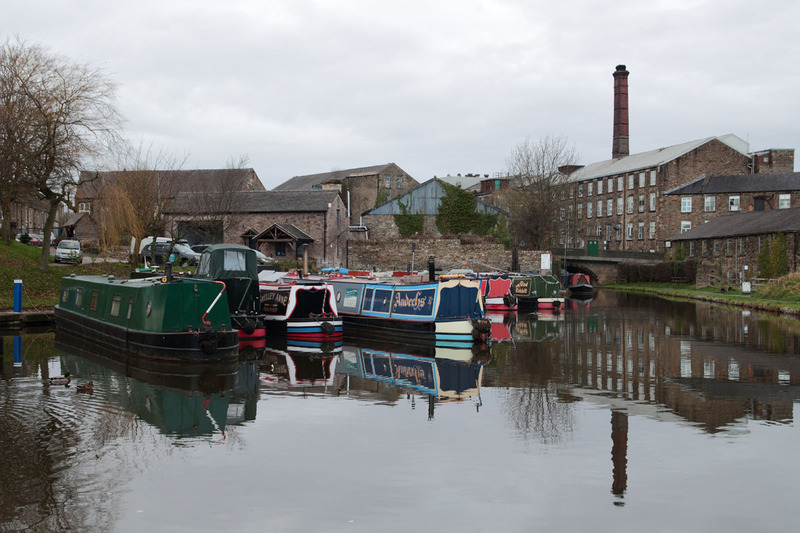 Originally a woollen mill this now grade 2 listed building is sadly in dire need of repair. It was from here we began the climb out of the valley along Crimble Lane and then back to the pub along War Office Rd. 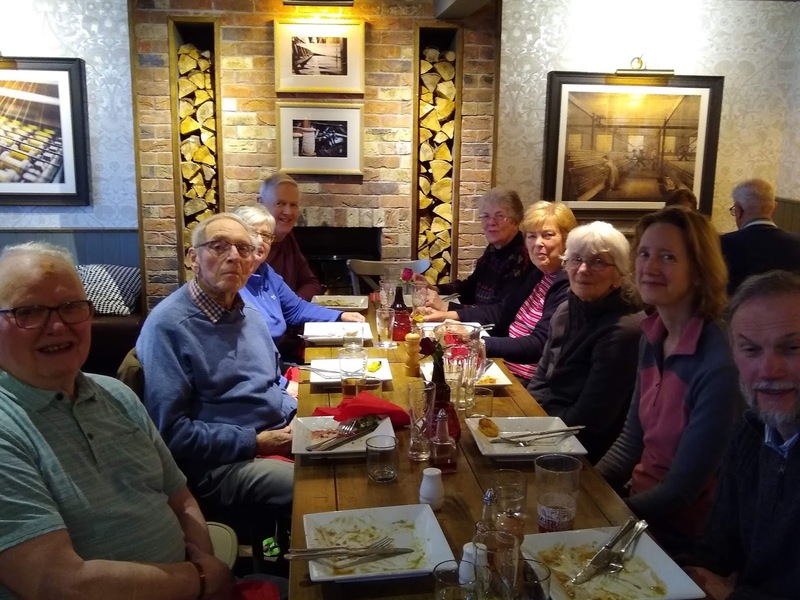 As usual we had lunch organised and hungry after our exertions we all tucked into an excellent meal which everyone enjoyed. Walking distance 5 miles. Time 3 hours. Plenty of water rushing by. 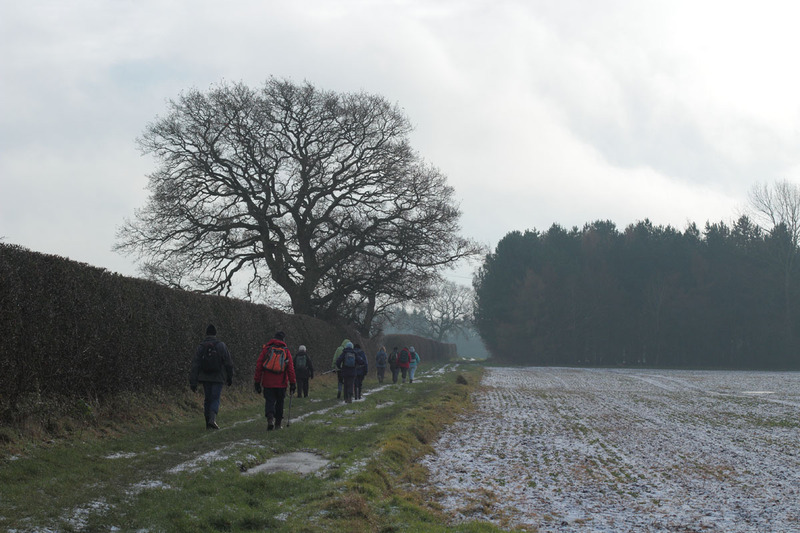 In January we do not have an organised walk because of the unpredictable weather and the absence of members on holiday. 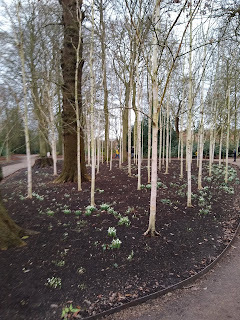 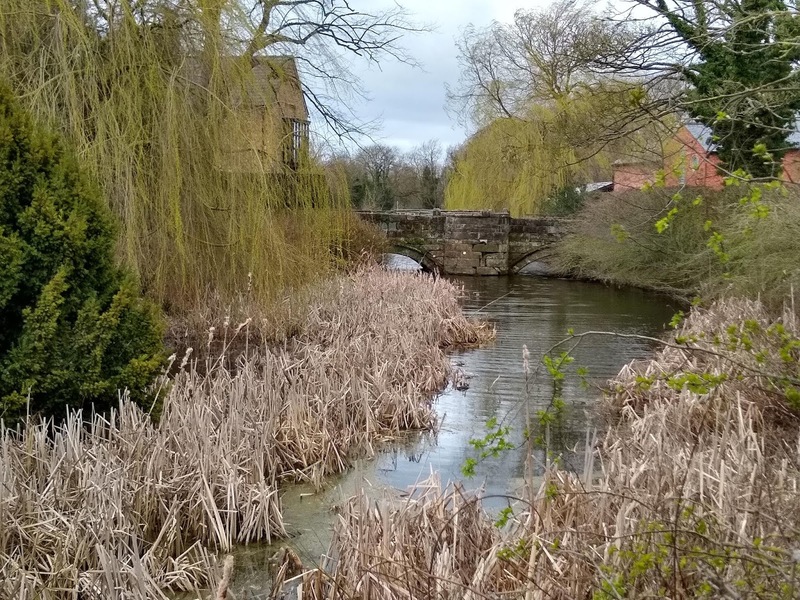 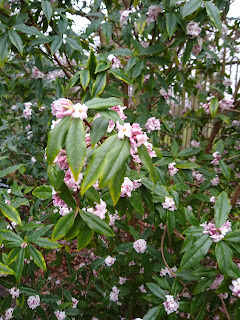 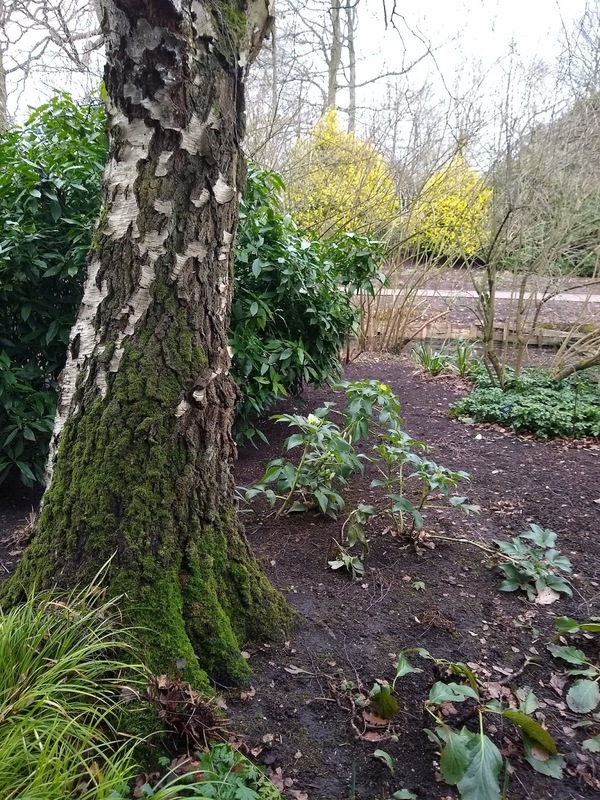 However, this year we decided to meet for a pub lunch which was extended to coffee at the National Trust Visitor Centre, a walk in the park and a long lunch at the Axe & Cleaver in Dunham Massey. 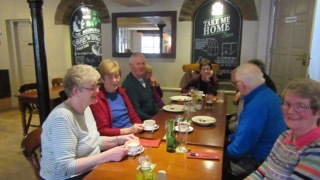 Eleven members turned up in the coffee shop and after a refreshing cup of coffee we sorted ourselves out into two groups. 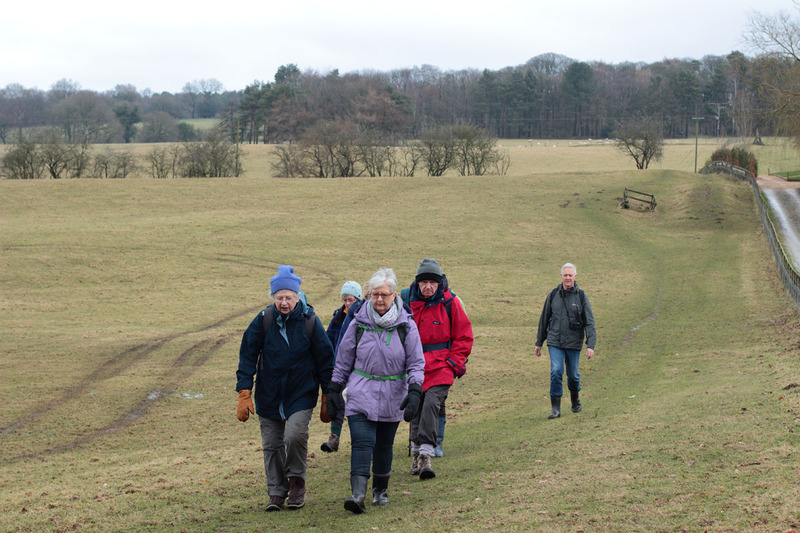 Those who felt like a longer trek around the grounds set off on a brisk 5km walk. 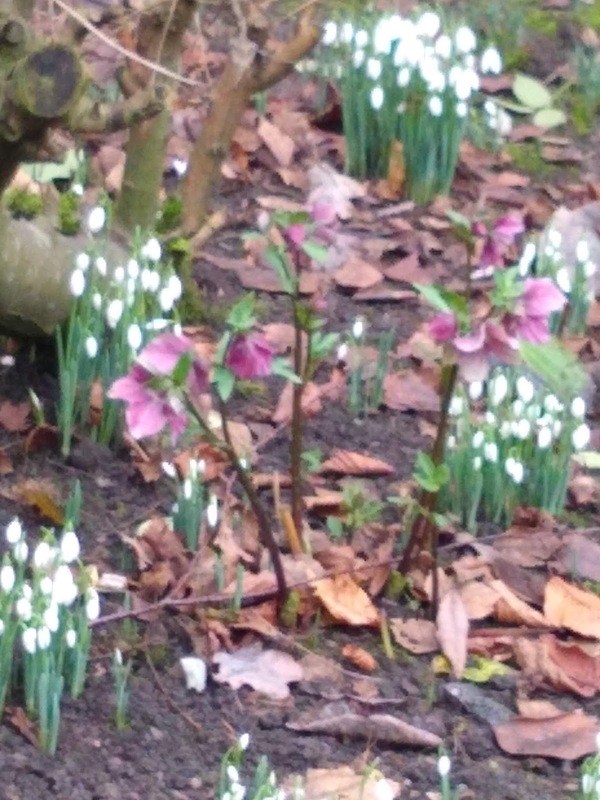 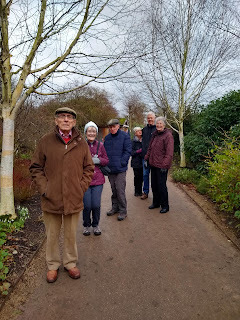 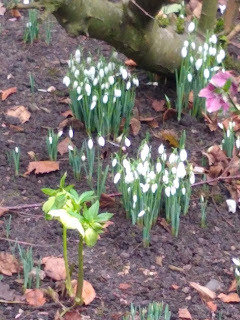 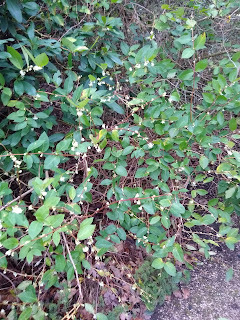 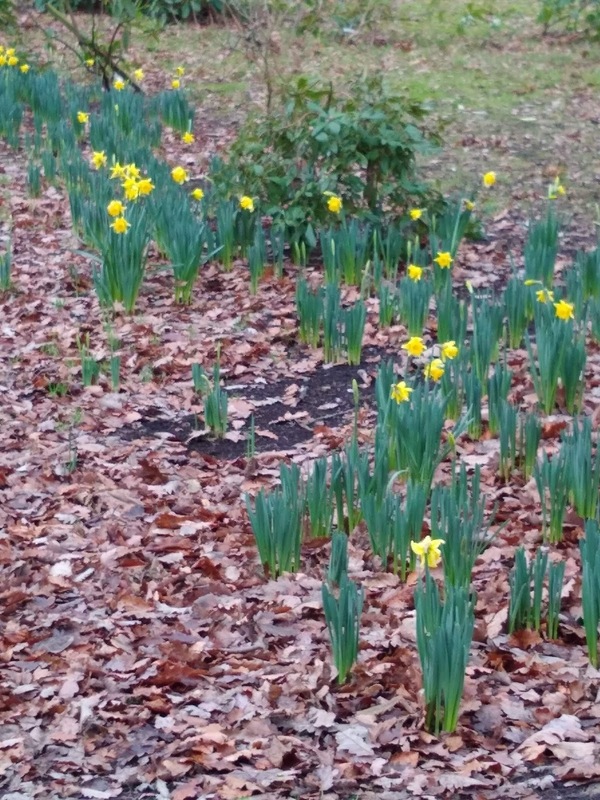 The remainder opted for a leisurely stroll around the gardens which even in winter time are full of interest. 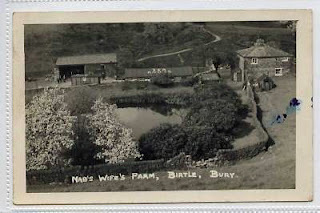 Photographs showing the garden can be found below. Everyone enjoyed their selected walk and we all met up again at the pub for an excellent lunch. It was agreed that we should repeat this type of event next year. 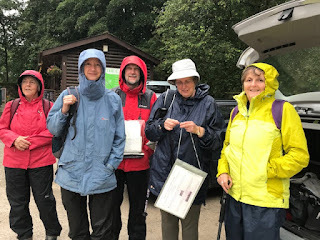 Here is proof that some of us did walk! Traditionally this usually a short walk followed by a long Christmas lunch. 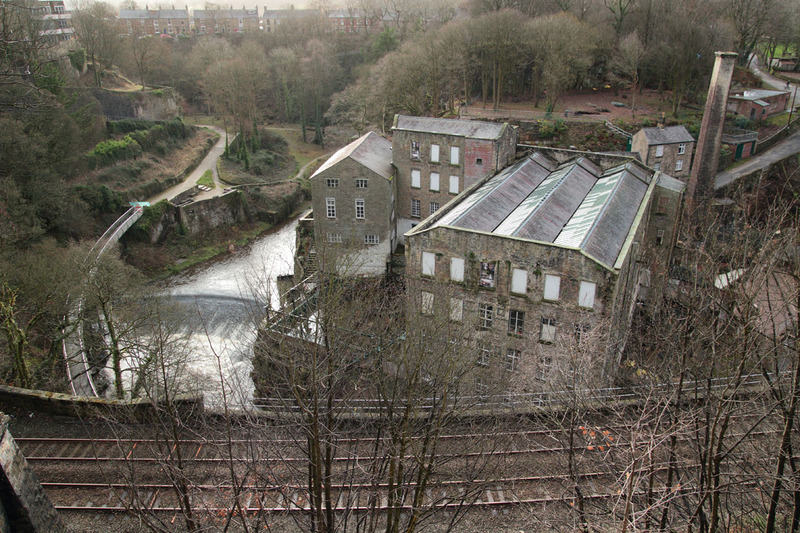 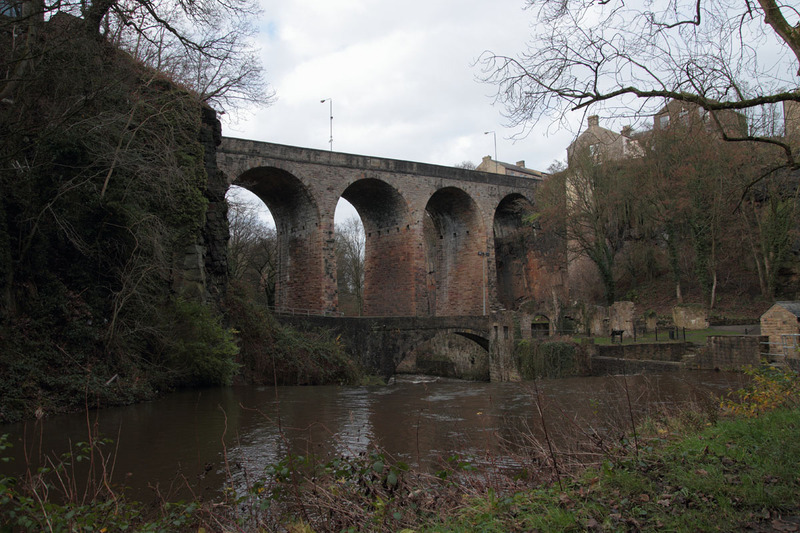 We started from the Torrs River car park in Hague Bar, New Mills and made the short decent to the river valley below. 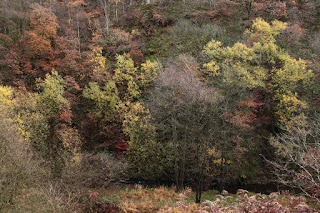 From here we continued along the path by the Goyt looking forward to making the crossing by the Millenium Bridge.Unfortunately on arrival we found the bridge closed and had to make a detour up the hill and into New Mills so we could only view the spectacular bridge from the road above. 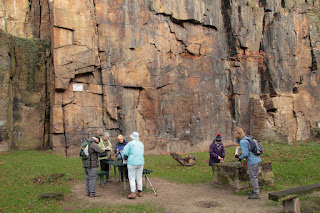 Eventually we found our way back down to the river where we stopped in the gorge for coffee. 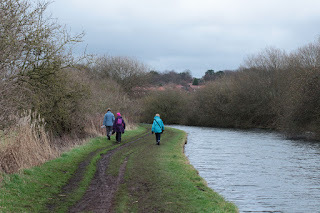 The ramble then continued along the river until we met the bridge across and the pathway to the Peak Forest Canal. 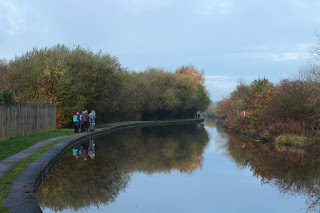 We then walked along the canal to Hague Bar and returned to the car park. A distance of 4.5 miles. The important part of the day followed when we retired to the Pack Horse Inn, New Mills to enjoy an excellent three course Christmas lunch complete with Christmas Pudding and crackers. 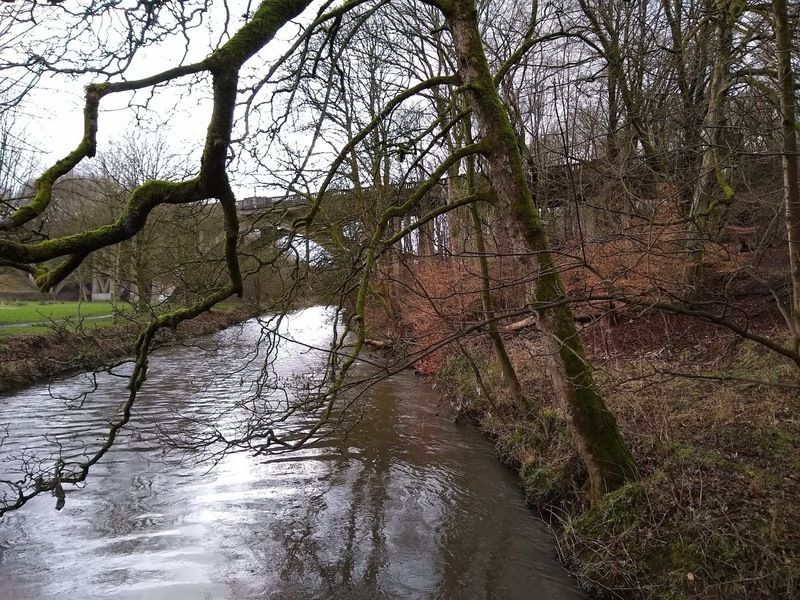 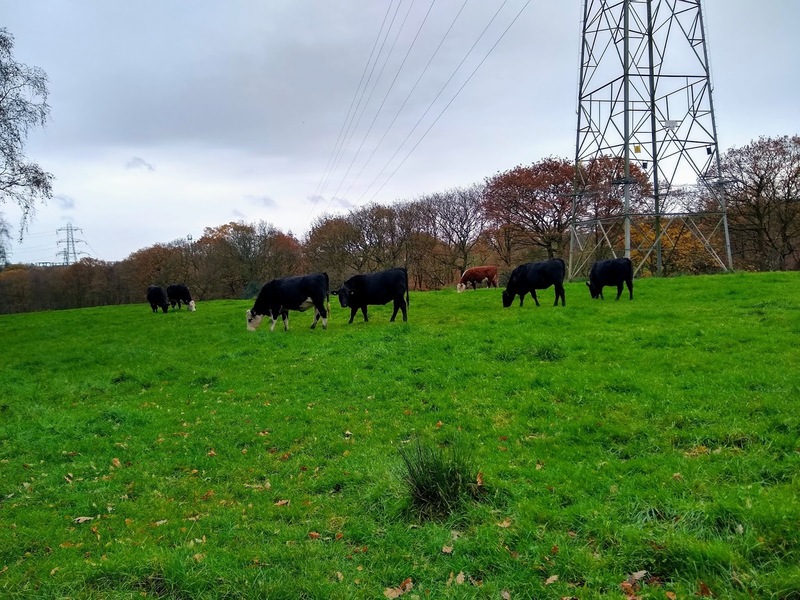 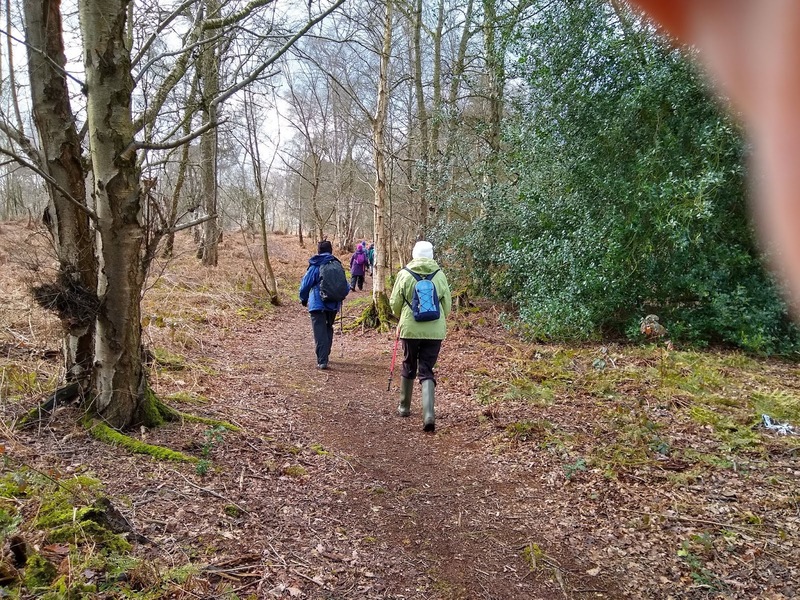 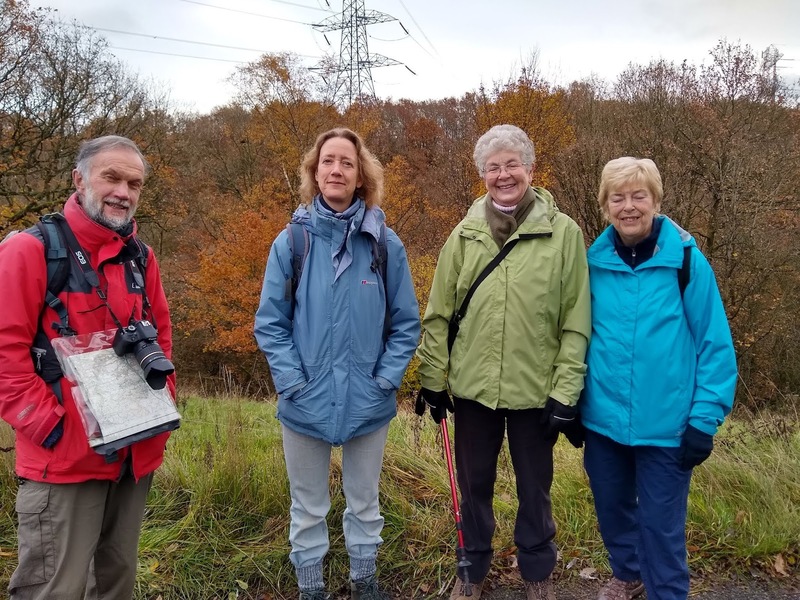 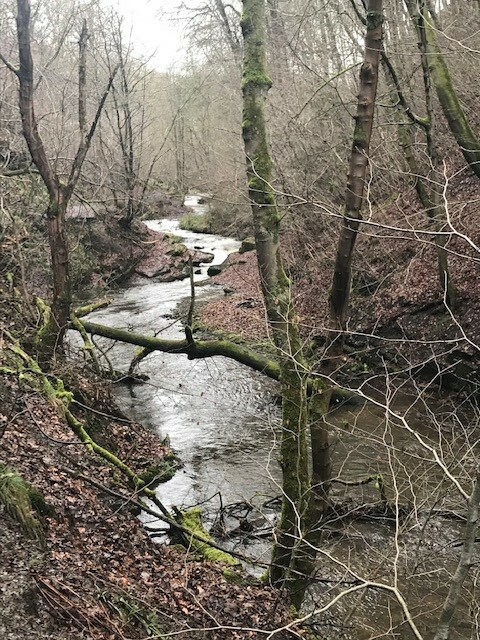 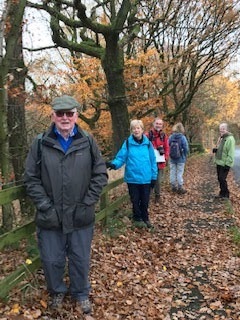 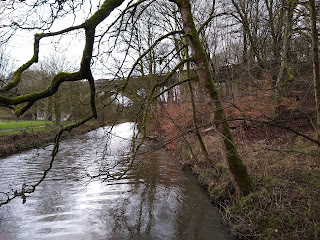 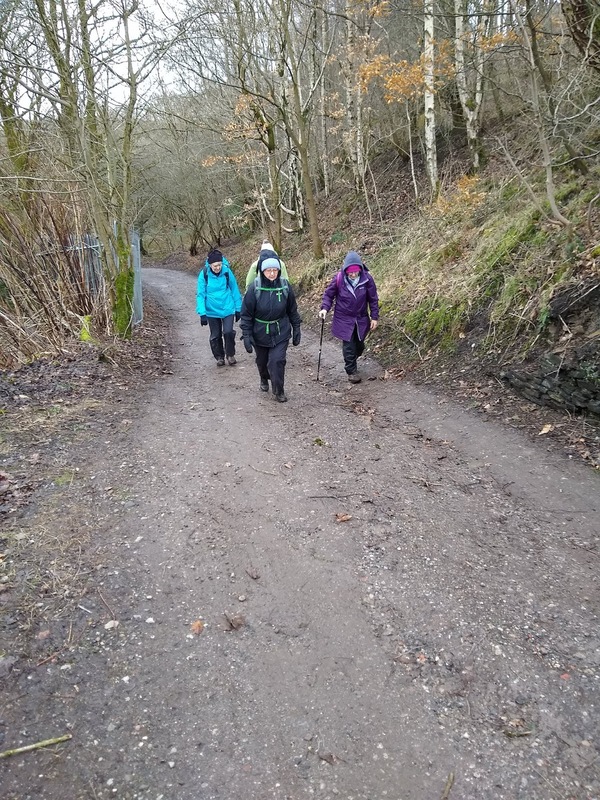 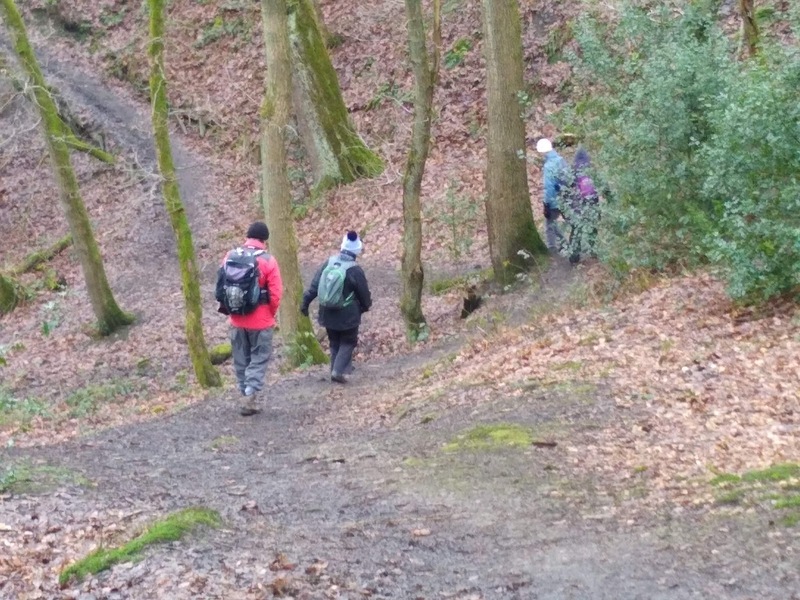 A party of six set out from Norden, Rochdale for this 5 mile ramble through the local countryside.From the car park we turned into Black Pits Lane and very soon arrived at the footpath alongside Naden Brook. 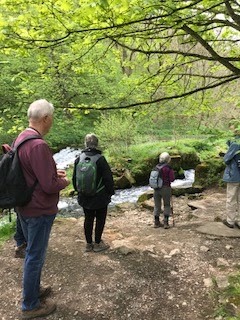 At the bridge next to remains of the old mill, we crossed the river, and then began the climb out of the valley to a farm track which leads up to the ancient church of St James Bamford and the former pub known as the Chapel House, which is now a private residence. 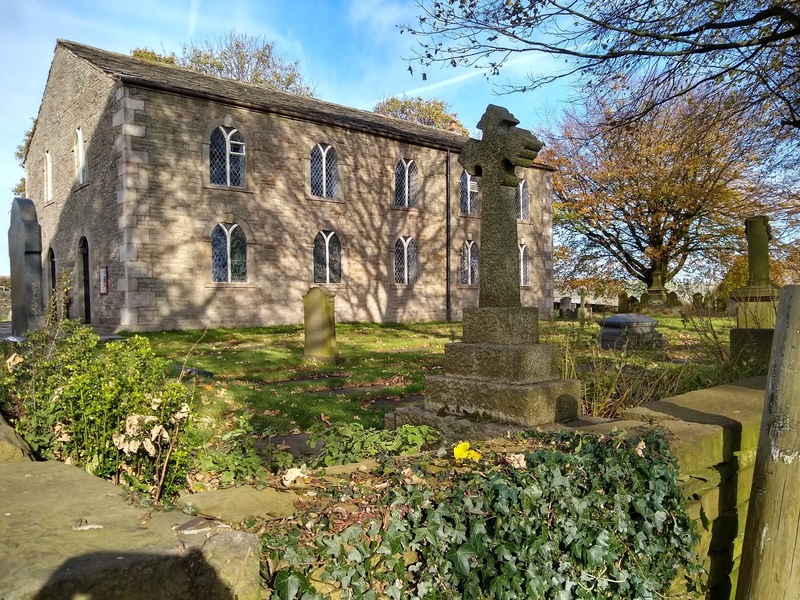 Here we stopped to admire the old church with its interesting grave stones and the views across Lancashire to Manchester and Derbyshire. 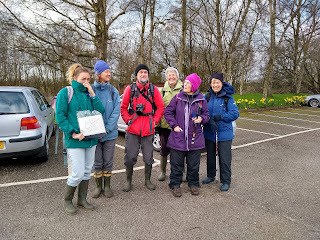 We then crossed the fields to the old schoolhouse before joining Ashworth Rd to take us down to Simpson and Gelder Cloughs. 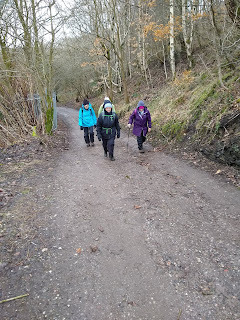 Unfortunately we found the road closed because of a landslide and we had to retrace our steps and take an alternative path down to the valley. 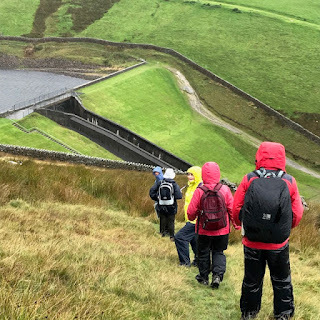 Not wishing to miss out the scenery at Simpson Clough we took a detour through the valley knowing that we would have to retrace our steps, but it was worth the effort and we found a grassy bank for a coffee break. 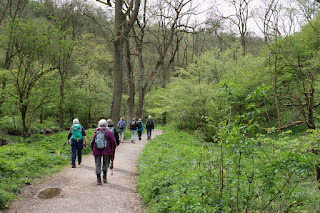 Returning the way we had come we then passed through Carr Wood and walked along the Naden Valley to Black Pits where we extended the walk by following the Millcroft Brook up to the tearooms (now closed) and then back to our start point. Lunch followed at the Bridge Chippy where we enjoyed traditional Lancashire fish and chips! 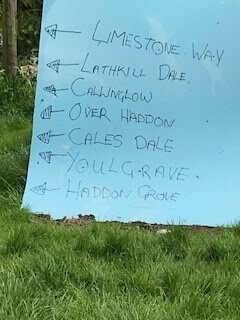 Didn't meet any of them! 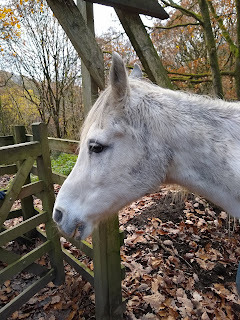 Just a load of old bull - but a bit too friendly! 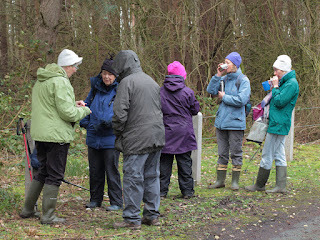 Lunch at the chippy! Mmmmm. 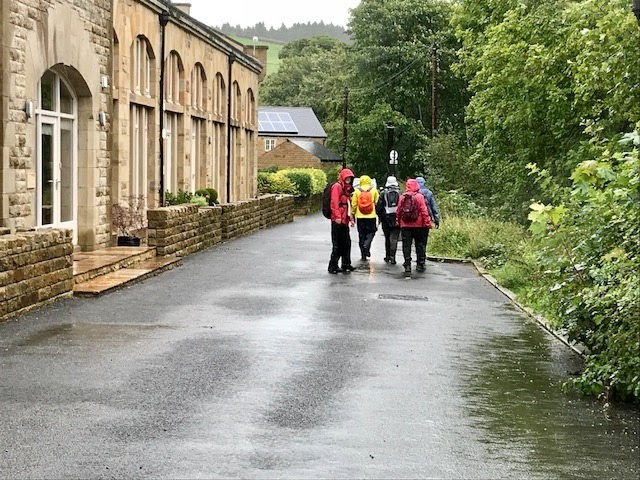 We left St. Paul’s Church under a threatening sky towards the beautiful village of Barley in Lancashire only to find the rain had set in on our arrival about an hour later. Six of us left the car park for the old water works building which now boasts a glorious conversion to apartments.Next over the footbridge to our first climb of the day over a rather boggy, clumpy set of fields. As expected, the path proved a little difficult to follow here but after a bit of team work, we were back on track passing a farmhouse and over the hill towards Newchurch, The village is famous for its ‘Witches Galore Shop’ and usually has three old stuffed crones sitting outside but their absence probably reflected the extreme weather conditions that proved too much, even for them! 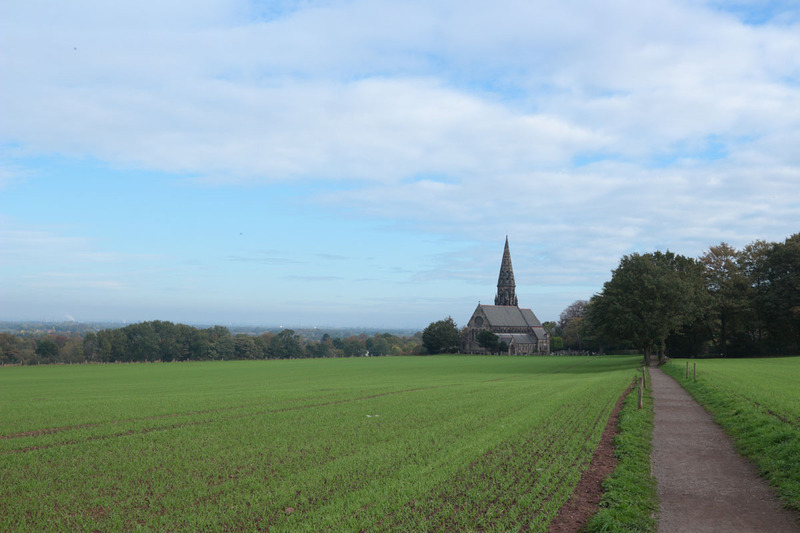 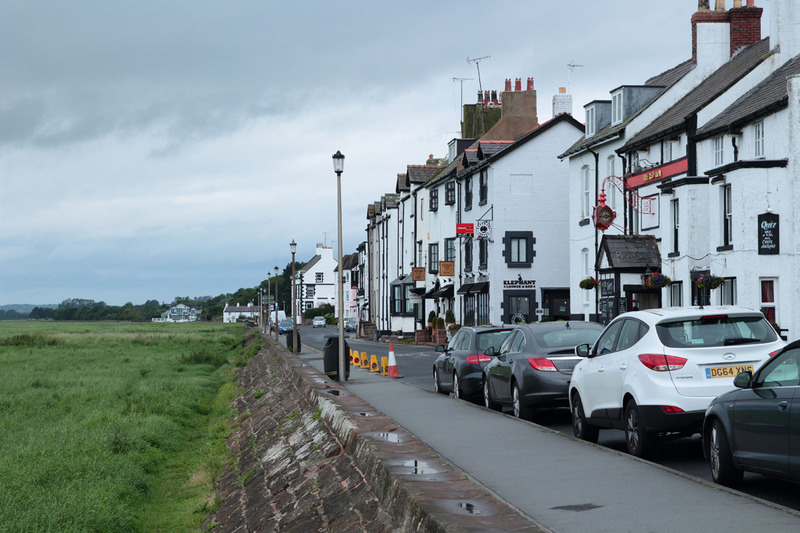 Originally the village was called Goldshaw Booth but the Newchurch name came into use in October 1544 when John Bird, Bishop of Chester, consecrated the new church of St. Mary. 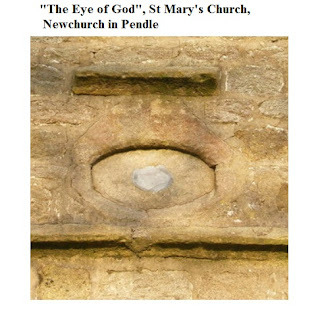 Prior to that, there had been a chapel recorded on the site of the current church since 1250.There is an oval set in the west face of the tower known as the ‘all seeing eye of God’, reputed to protect the villagers from evil. 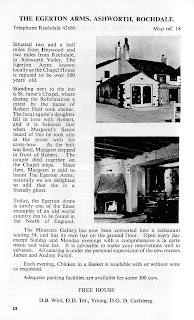 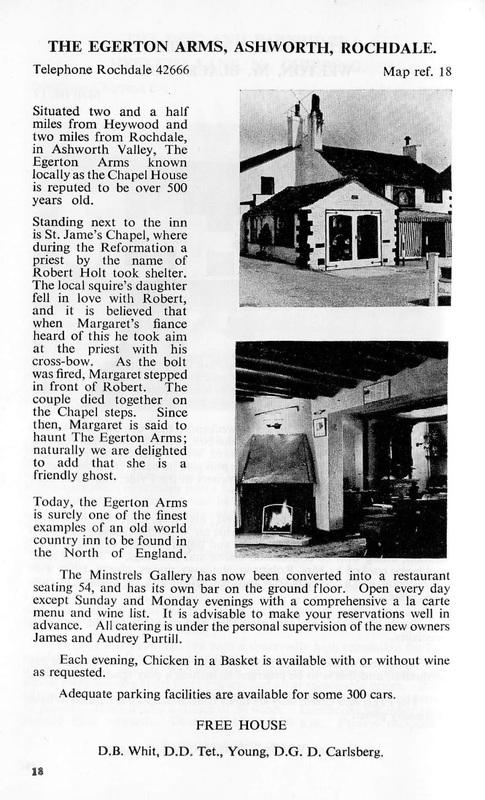 This and other surrounding villages are, of course, famous for their ‘witches’ who suffered the trials in Lancaster Castle following various reported activities which were put down to their craft. 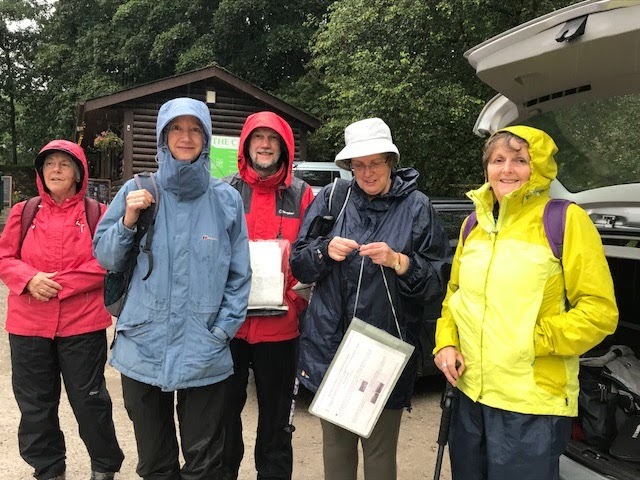 We escaped the rain by sheltering inside the church where we were greeted by a couple of ladies who had, following the cancellation of their village flower festival, decided to provide coffee and homemade cake for anybody crazy enough to venture out in such dire conditions.As we dried our gear and settled down to coffee and cake, they explained how the church had become part of the Blackburn Diocese only in 1926, so we said we would think of them in 2026 when they would be celebrating their centenary within the diocese. Much as it would have been lovely to spend all day in the church, we set off in intrepid fashion along the road towards Sabden Fold, past the Shekinah Christian Centre.Then came our second climb over Driver Height which is not only terribly steep, but tantalised us with many false summits before reaching the top, made all the more ‘fun’ by the driving rain.Despite all these forces working against it being a nice walk, everybody came together in camaraderie fashion and decided this was a good place to take numerous photos of the group, while we tried to stumble our way down the steep drop toward the reservoir. Then along the easiest part of the walk back to Barley following the reservoir. 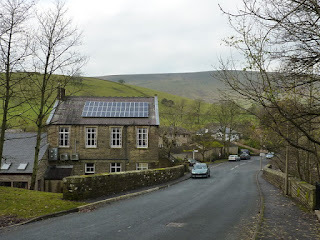 We passed Pendle Hill which is, of course, famous for George Fox who experienced his vision there which led to his forming The Quaker Movement. 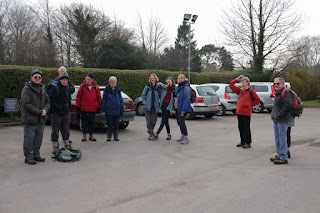 Back at the car park, we dried off and headed for ‘The Barley Mow’ who welcomed us with some very good food. 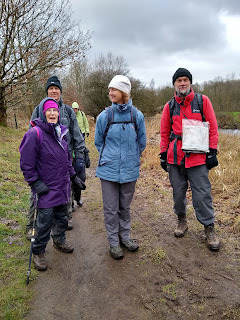 A great day and turnout considering the weather, though maybe the next one should be planned for a nice hot summer’s day. 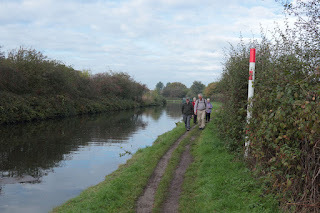 Following the Canal, we passed the start of of Marple’s 16 locks and descended a path back to Brabyns Park. After the interesting walk the group adjourned to The Railway pub in Marple for lunch. Boars Head - waiting for the pies to come! Our route started at Over Haddon above Lathkill Dale near Bakewell and I remember thinking, as we descended the steep road to the bottom of the Dale, that at the end of the walk this hill would be the sting in the tale. The walk along the dale was beautiful with the sparkling water to our left. 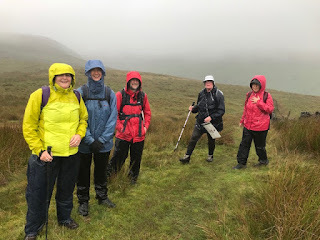 The path starts as a very well constructed track but as we got deeper and deeper into the dale the track became more rugged and the feeling of walking in the bottom of a steep sided valley was more intense. 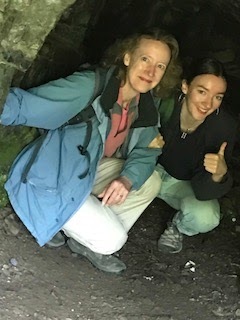 There are caves on the way and one was explored by two of the younger group members! 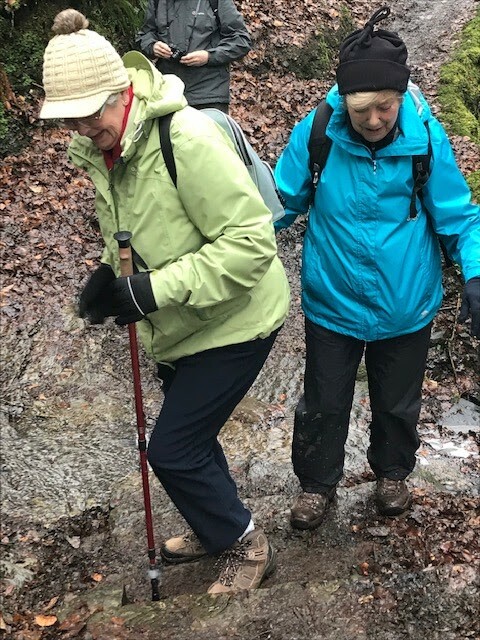 To reach the head of the dale the route was really quite challenging for some of us and required care by all. 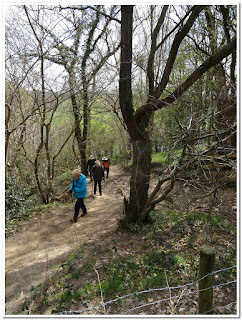 Eventually we were at the top of the cliffs and began our walk back. 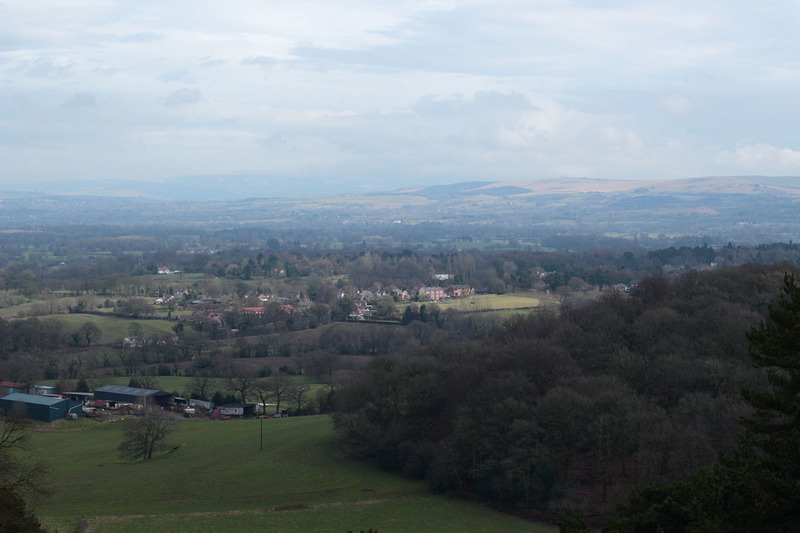 The views were such a contrast to the earlier ones. 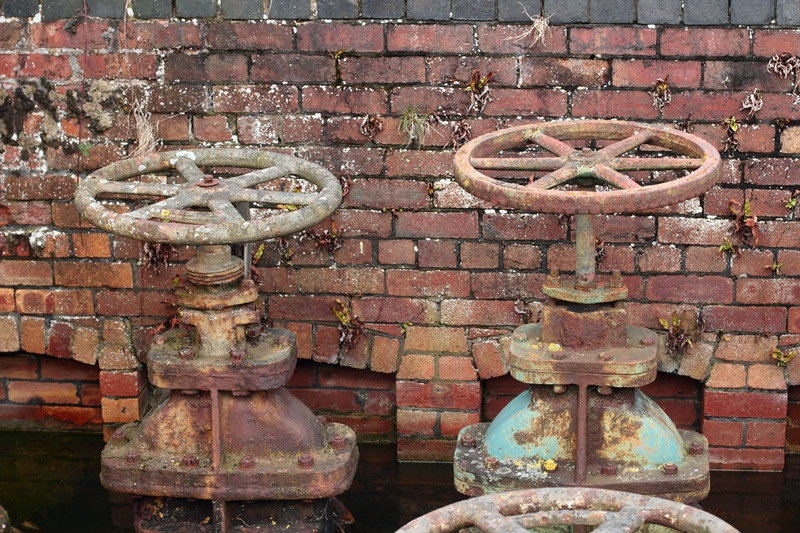 These gave the wonderful feeling of expansiveness that is so precious to urban dwellers. 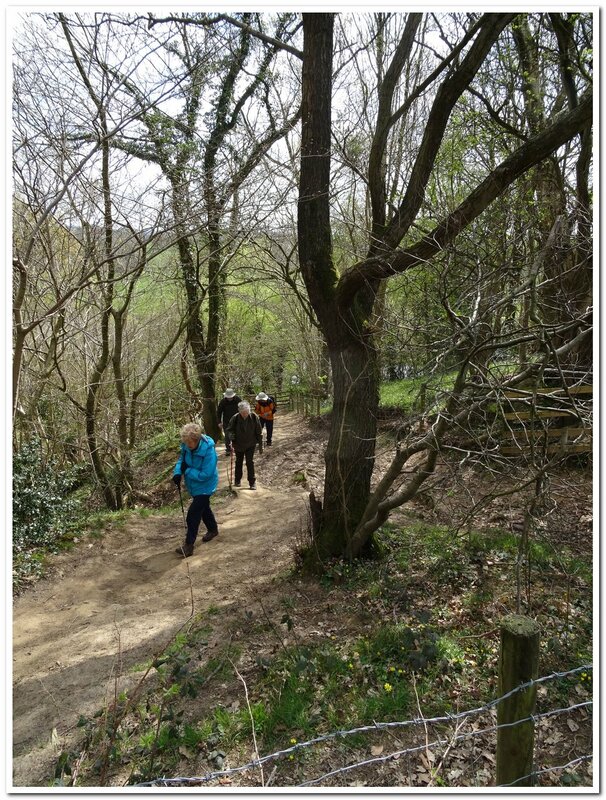 It was a D of E weekend and it was great to see cheerful groups of young people out in the country side working together and enjoying themselves. 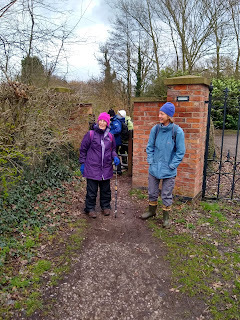 Some of their map reading needed a bit more work though and one of our group gave a good piece of advice saying that if you thought you had to climb a wall with no stile you had gone wrong. 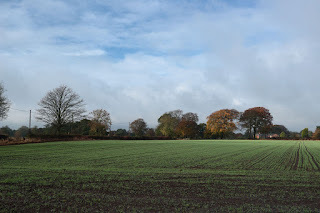 From here a well trodden path went through a farmyard where a Blue poster pointed the way to the various nearby places. 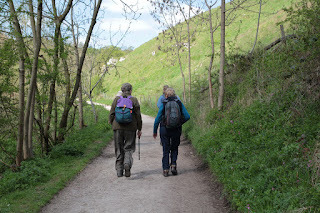 The route then dropped back into the valley bottom and we walked somewhat slowly back to Over Haddon. 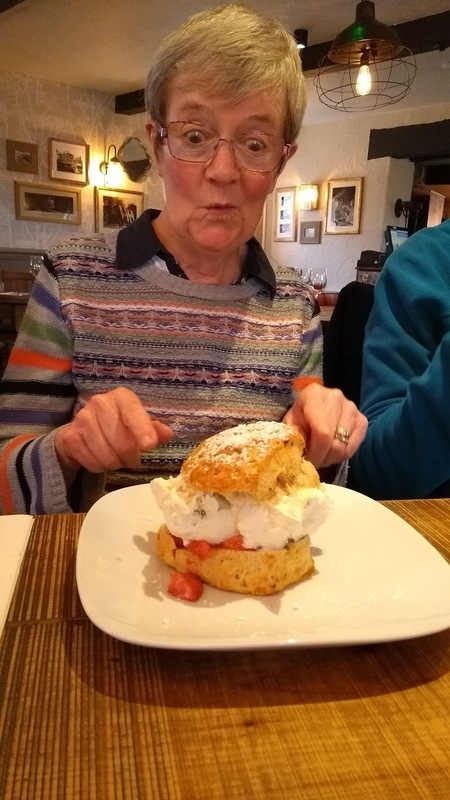 Of course there was that slog up to the car park but there was the reward of the Garden tearooms with huge pieces of fantastic cake. A good walk with a few challenges and beautiful weather.
. 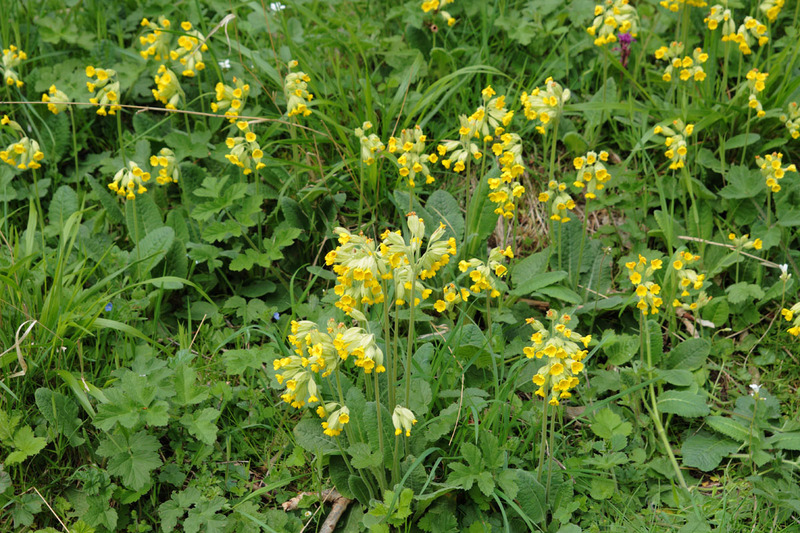 The limestone grassland was full of them. 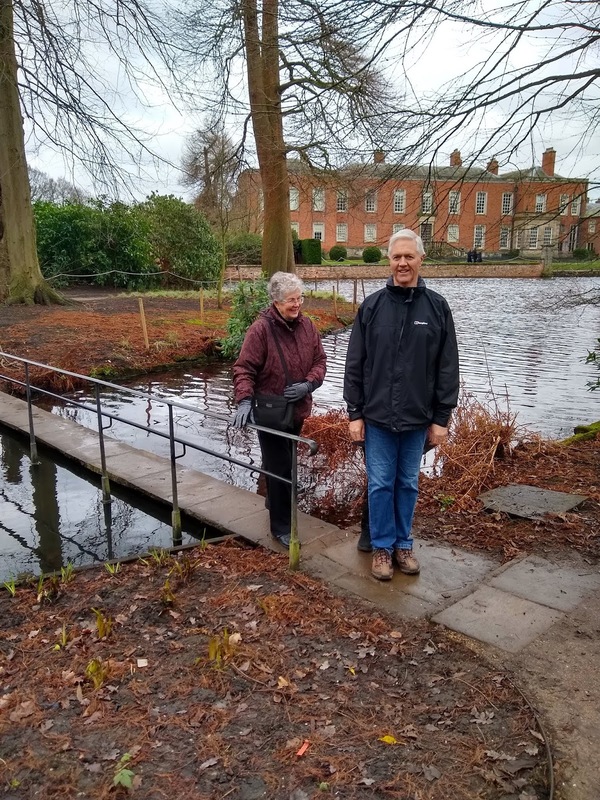 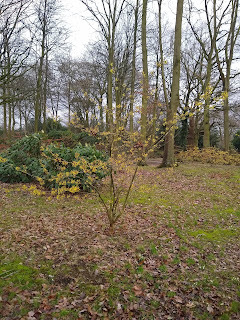 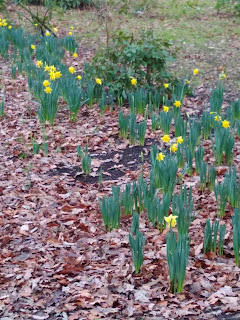 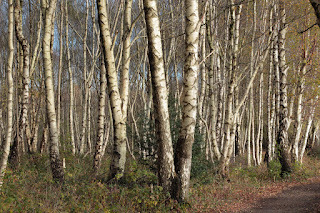 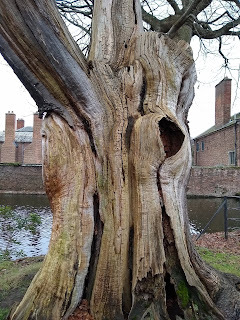 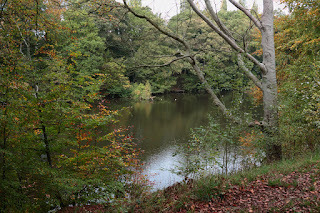 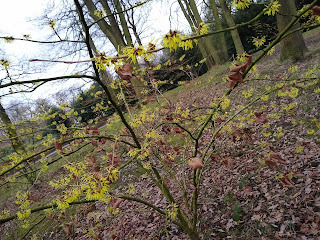 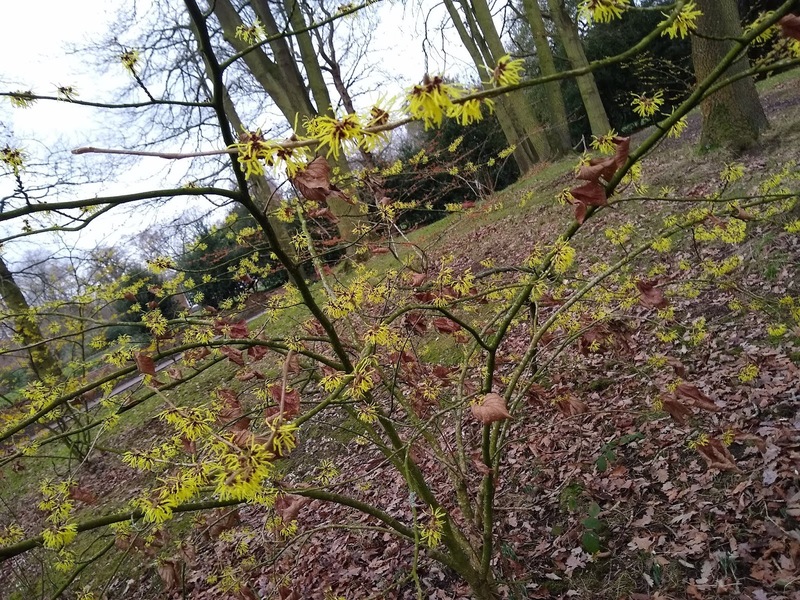 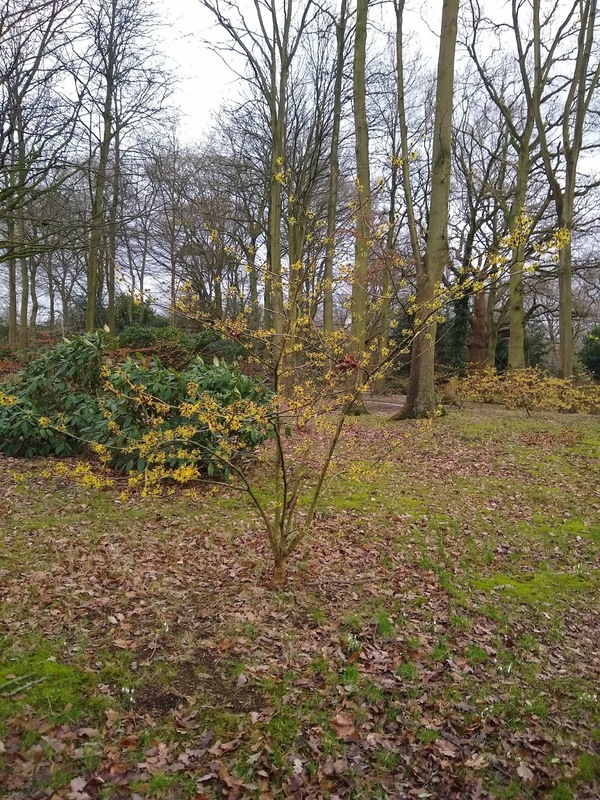 Our group repeated a short, 4 mile, circular walk from the Axe and Cleaver at Dunham Massey. 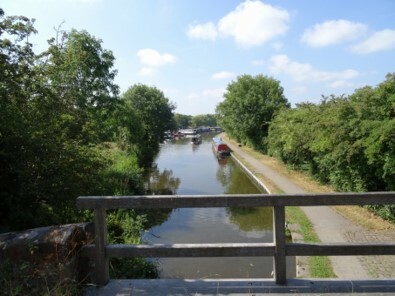 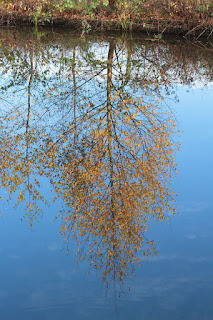 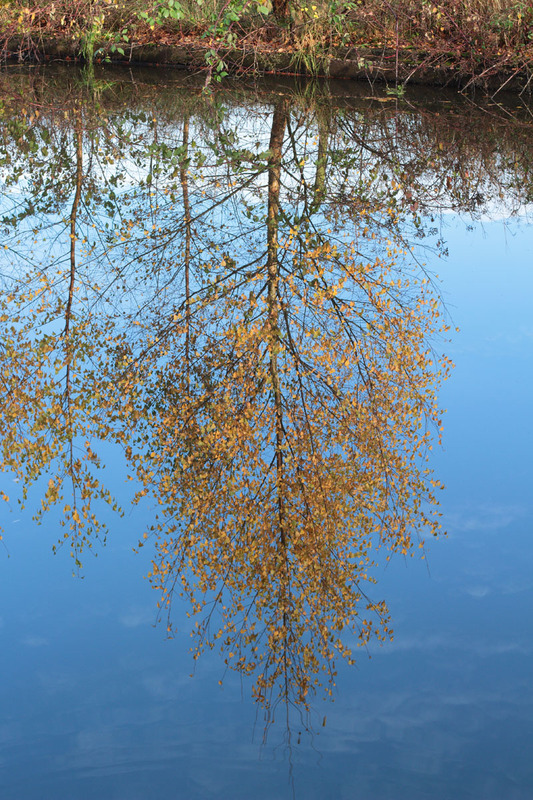 The weather was a distinct improvement on last September although parts of the canal path were muddy. No heron was sighted this time unfortunately but a canoe was spotted on the canal. 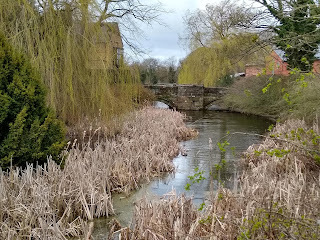 The walk took us through the village and the National Trust site where some retail therapy was undertaken in the NT shop! Everyone enjoyed the meal at the Axe and Cleaver at the end of the walk. 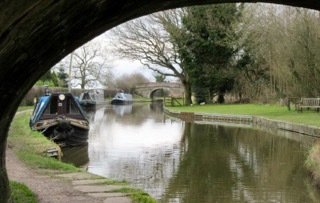 Axe & Cleaver for a good lunch. 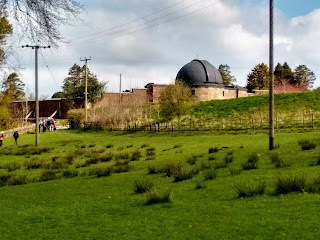 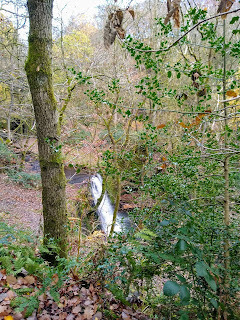 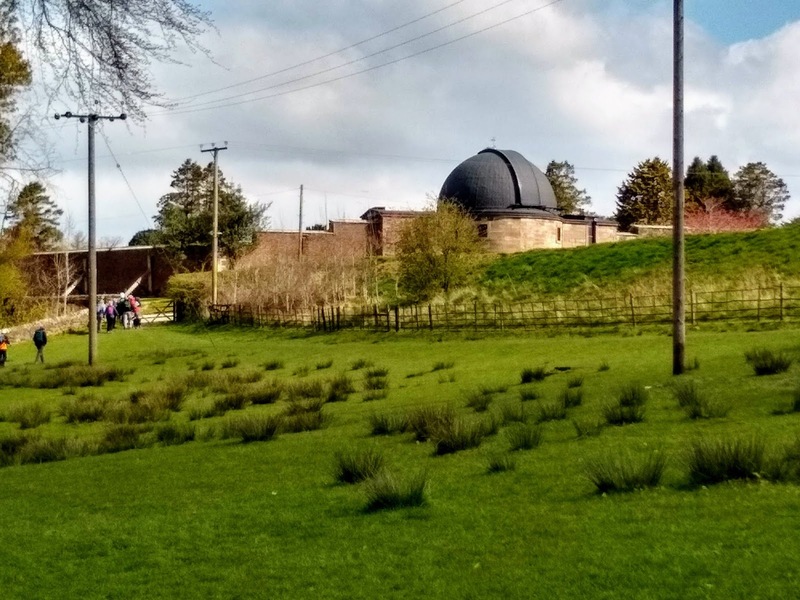 We had a pleasant walk at Alderley, mostly on the south side of the Macclesfield Road, through the old mine workings and Windmill Wood, ending up on the Edge at Stormy Point, with a view across to Lyme Park and the Peak District. 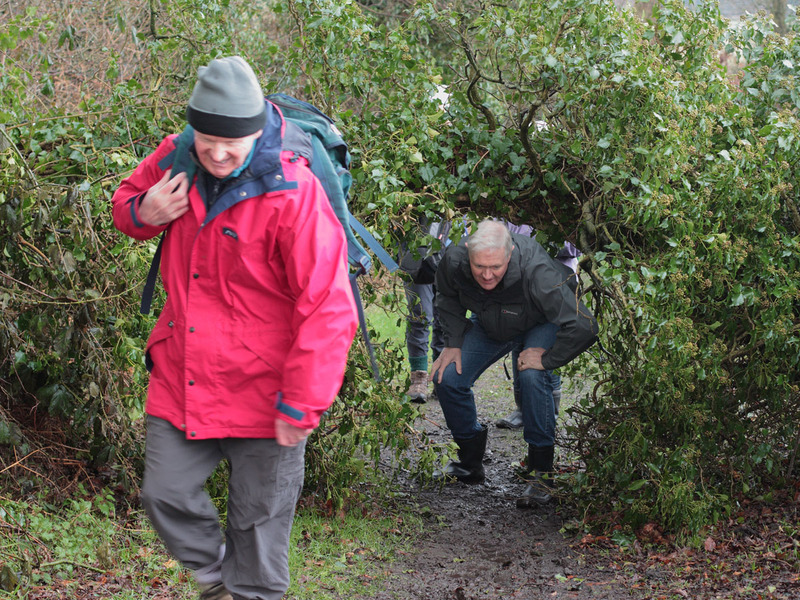 We had to negotiate a couple of quagmires and one tunnel under a fallen tree. 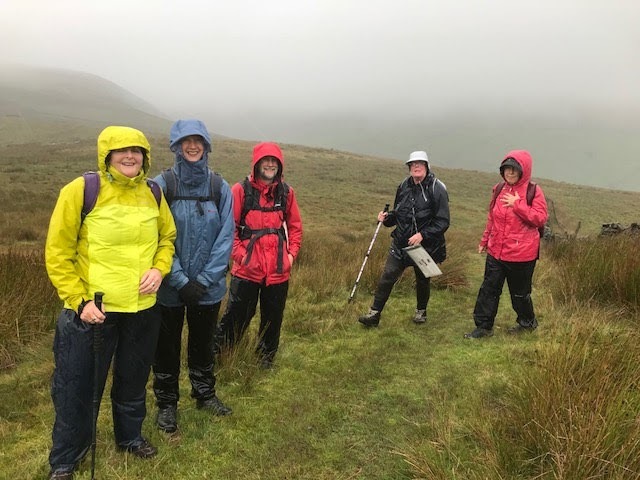 Fortunately the walk just fitted into the gap between two bands of heavy rain. 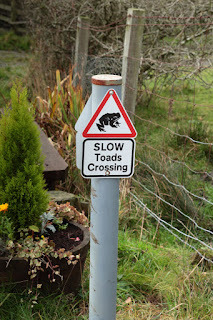 Lunch at the Wizard was good, if very slow. 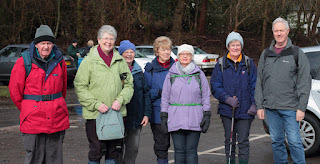 Due to extremely wet and cold weather conditions we had to cancel this walk. 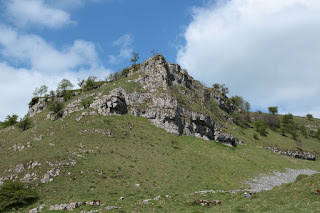 We shall probably tackle it later in the year when the weather will have improved. 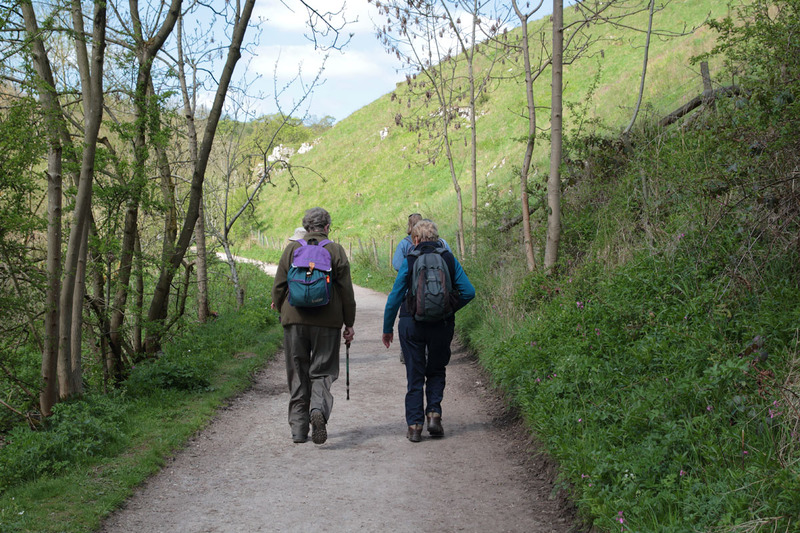 Making our way to the pub! 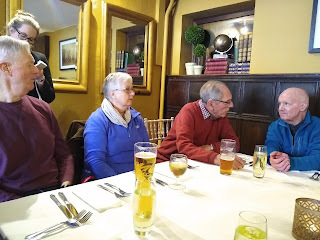 We had a very pleasant lunch at the Axe and Cleaver pub where we were able to sample the beer of the Dunham Massey Brewing Company! Should you be walking here! 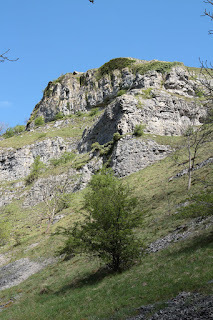 We then left the Trail and headed up a long, steep incline to the High Dale. 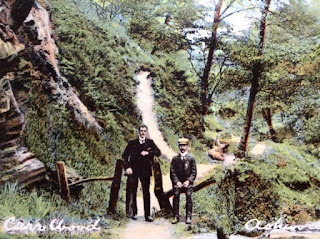 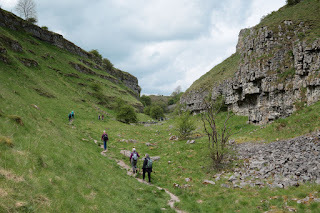 Walking through some disused mine-workings led us to the village of Brushfield and dropping down to the High Dale dry valley. We came in sight of the Hotel and had to negotiate a steep, flinty path to bring us back to the Trail and the final ascent of the 250 feet of steps back to the Hotel. 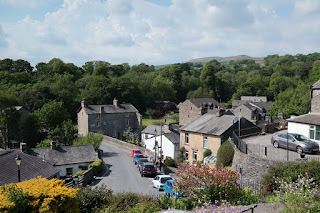 We appreciated the later than anticipated lunch and a cool drink at the Hotel, followed by an ice cream sitting on a bench overlooking the valley in glorious sunshine. 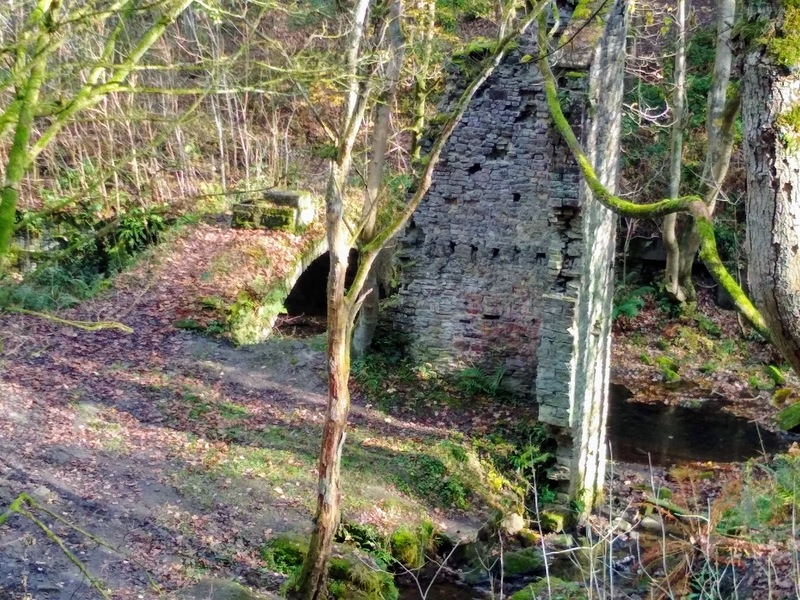 The path eventually opens out into the Old Warke Dam where the old estate lodge, known locally as the 'Gingerbread House' is sited. 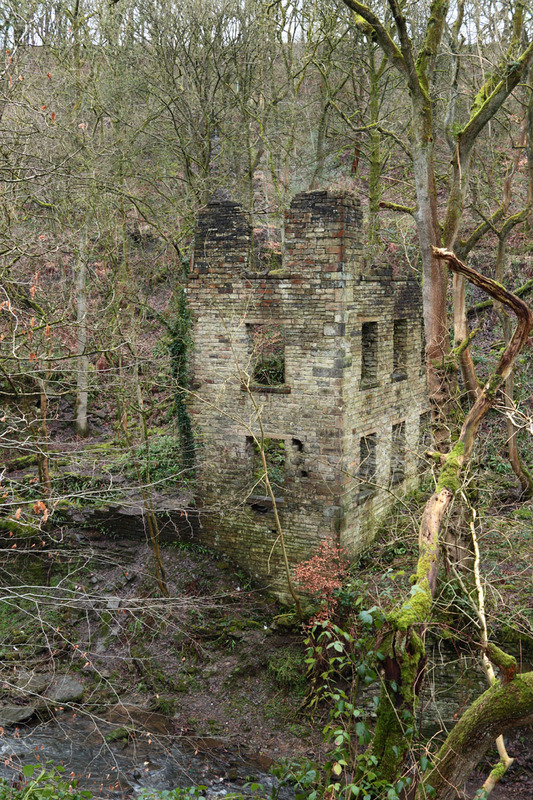 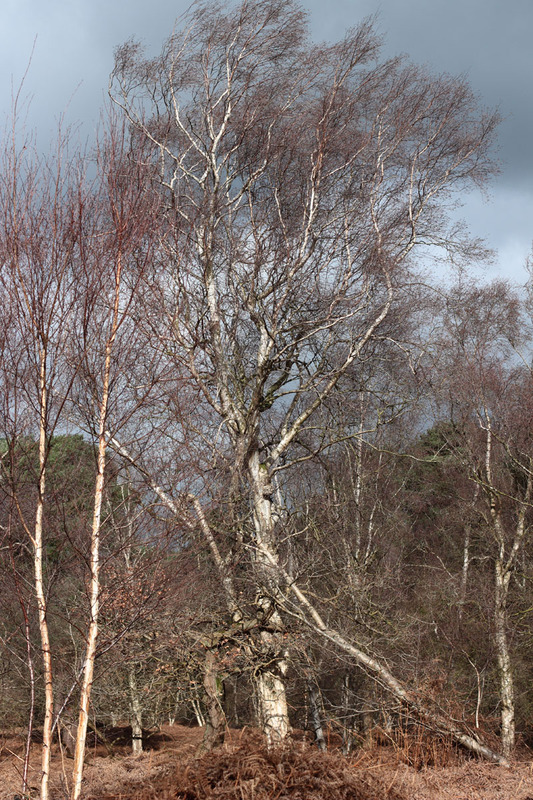 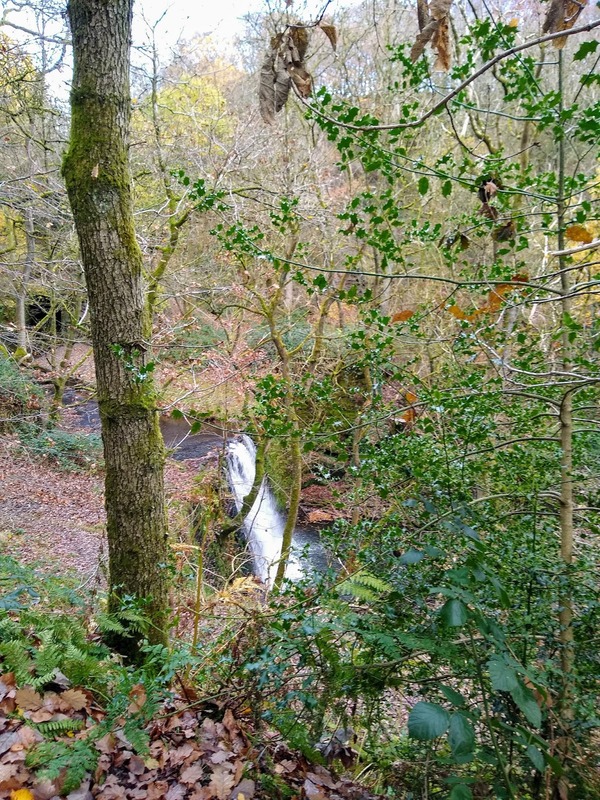 Further along is a platform extended into the dam and from here there are views of the woodlands across the water and the 'Aviary' an old hunting and fishing lodge which belonged to Lord Egerton. 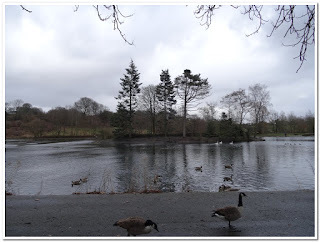 As expected there is plenty of water fowl to be seen in this area. 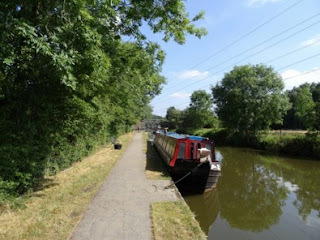 Following the route at the side of the water you come to a path on the right leading to Worsley Delph. 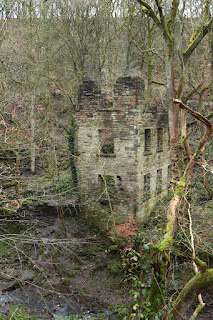 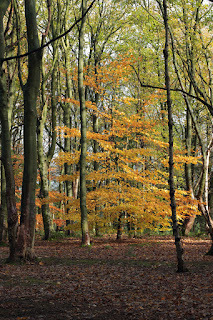 Again this is another natural woodland area full of interest and access has been made easier by the addition of a boardwalk in the wet areas.Returning from the Delph a short walk brings you back into Worsley and on the last stretch you have the opportunity to see the part of the old industrial heritage before returning to the car park. 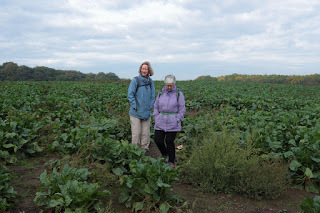 There are plenty of tearooms, restaurants and pubs for lunch or a snack at the end of the walk. 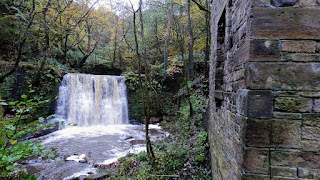 What time is the next train! 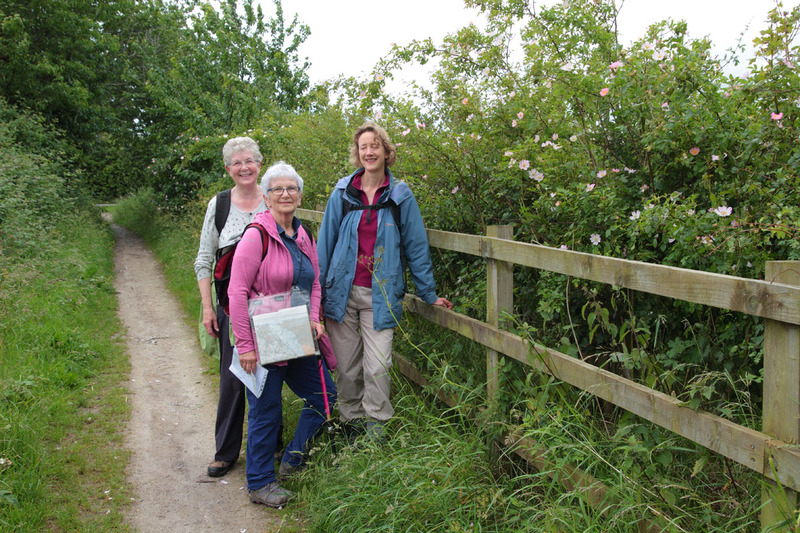 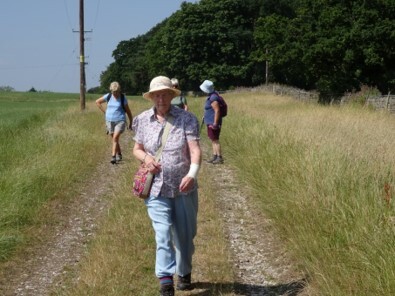 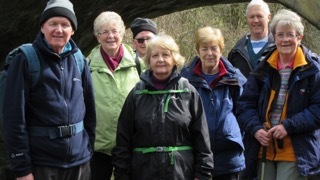 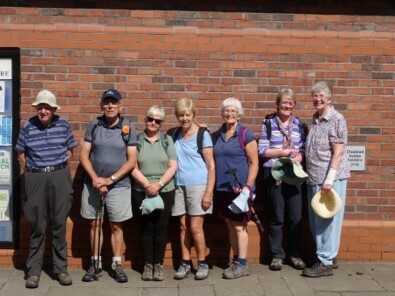 On a warm sunny Saturday eight of our members set off to walk a 5 mile circular ramble around Disley. 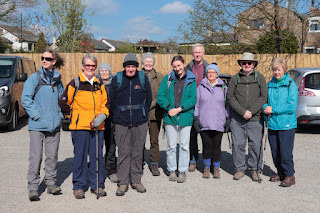 Leaving the White Horse Inn we took the path through the church yard to the first part of the walk which was to take to the top of the Bowstones. The path climbs steadily along the edge of the Peak District and although the track is difficult in sections the route is not too demanding. 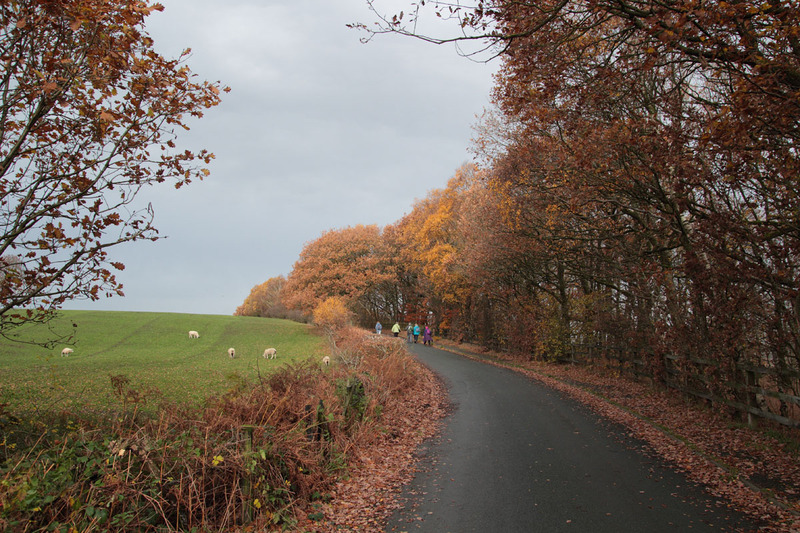 The final leg to the top is on tarmacked road and although the road rises steeply it is only for a short distance and once on the summit we were able to enjoy excellent views across Derbyshire, Greater Manchester and Cheshire. 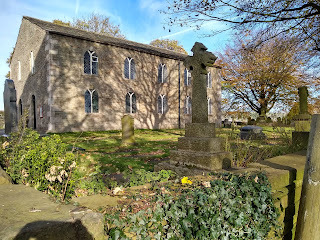 Of course we could not walk up to the Bowstones without stopping to look at these 10th Century Anglican crosses with their interlaced carvings and lettering. 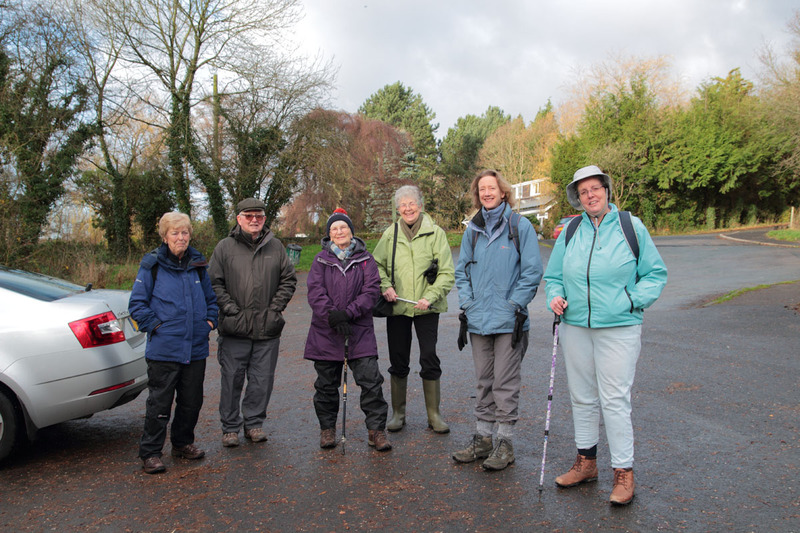 After a coffee break we then made the descent down from the ridge and into Lyme Park. 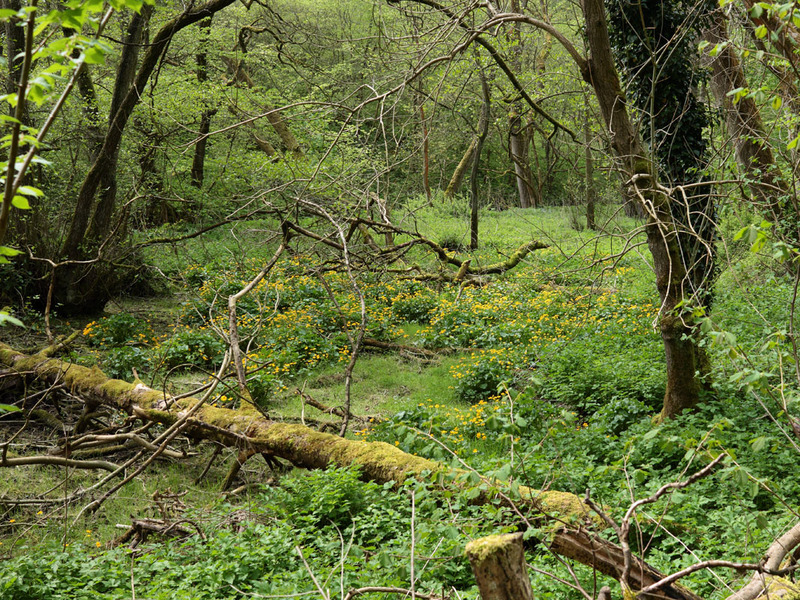 The route takes you through woodlands and parkland until eventually you reach the Hall in the centre of the park. From here we set course for the East Gate which takes you up the hill past the Cage and the Deer Sacntuary and onto the appropriately named Mudlane which returned us back onto the pathway to Disley. 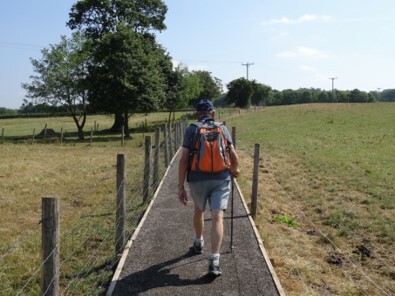 The walk took us around 4 hours complete but it was a warm sunny day and the excellent scenery and wildlife to see on the route made it all the more enjoyable. 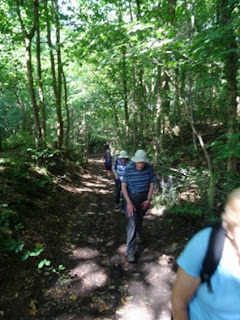 An enjoyable lunch in the White Horse followed the end of the walk. 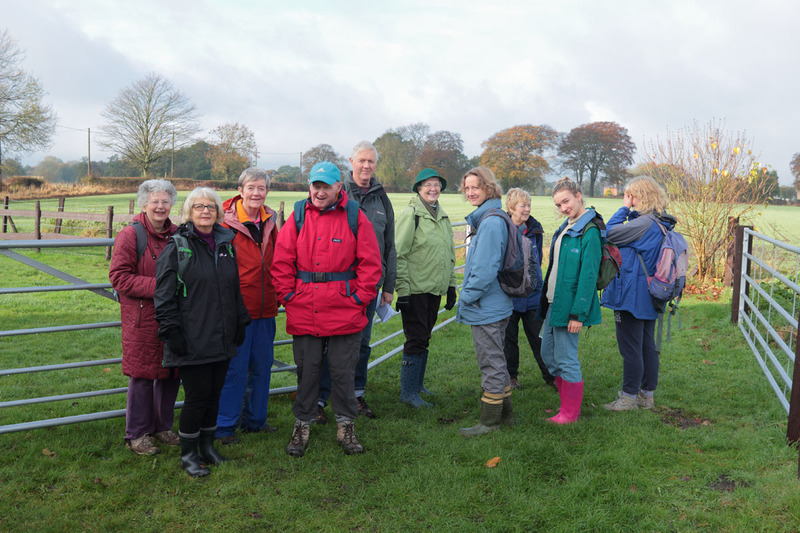 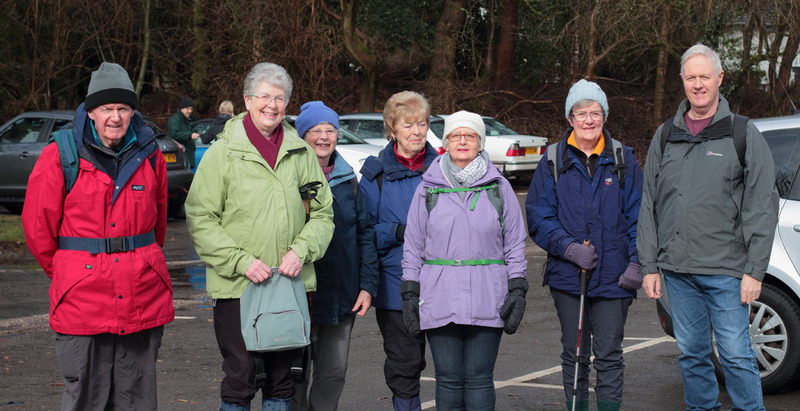 The Christmas Ramble was held last Saturday in Mobberley. In the morning on a very mild December day a party of 10 walkers enjoyed a short circular walk around Mobberley finishing at the Railway Inn. 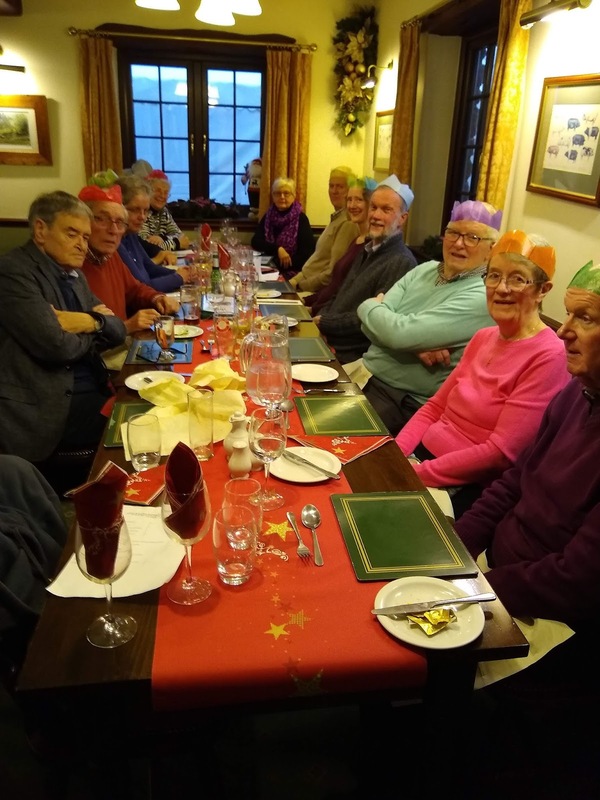 Here we were joined by other members of our group, to enjoy an excellent Christmas Dinner with all the trimmings. Thanks to Mike and Judith for organizing both the walk and the lunch. The train now standing.......is holding us up! 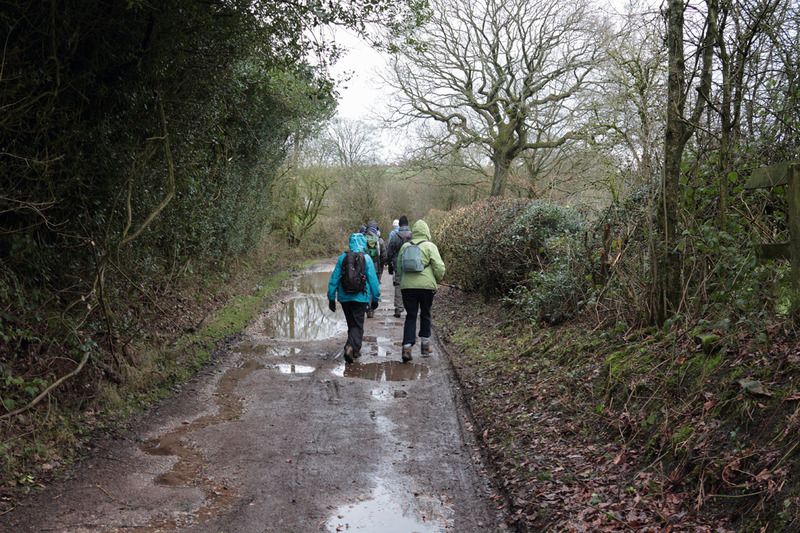 Wellies essential on this part of the route. 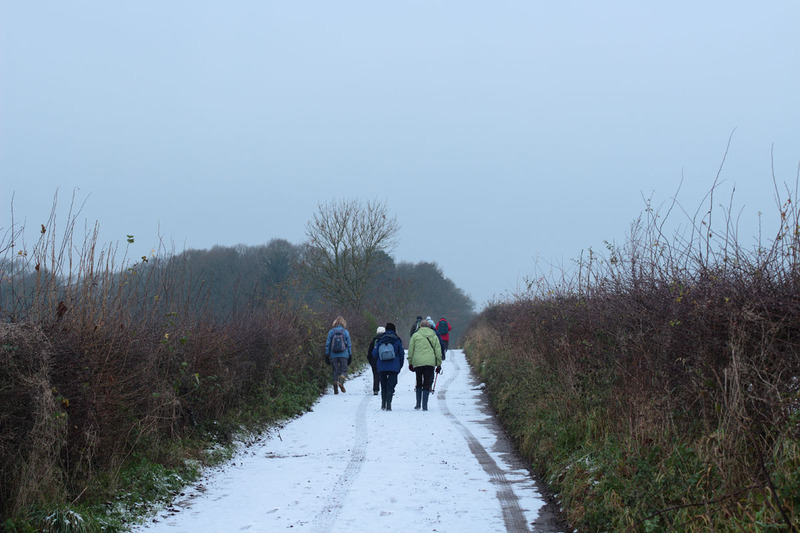 A disastrous start to this walk. Wet weather, traffic problems with 10 kilometre run in area which resulted in a late start and shortened route. However, on the plus start the rain stopped and we enjoyed an excellent ramble around the area in spite of muddy fields and tracks. 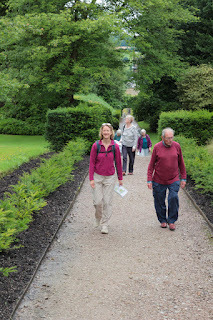 The walk finished with an excellent lunch in the Garden Kitchen at Arley Hall. 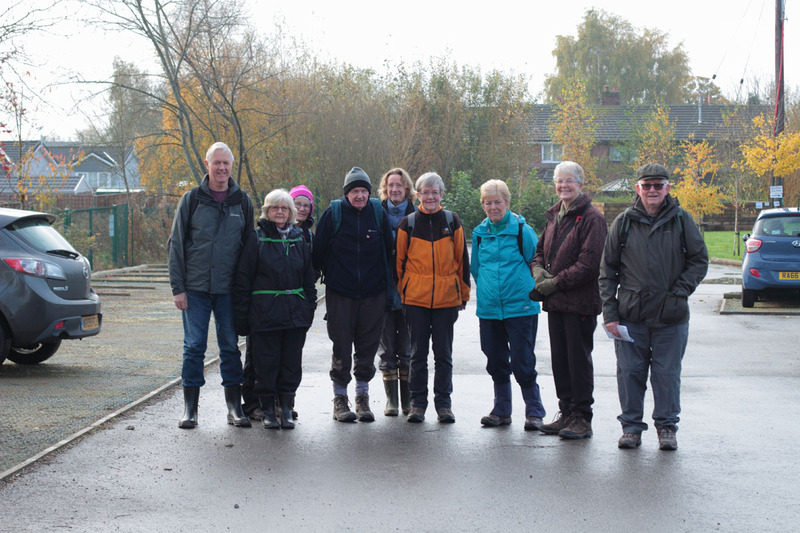 A disappointing turnout for a what was an excellent walk on a warm October Saturday. The route took us via fields of corn on the cob over to Budworth where we then followed paths across fields to the mere. 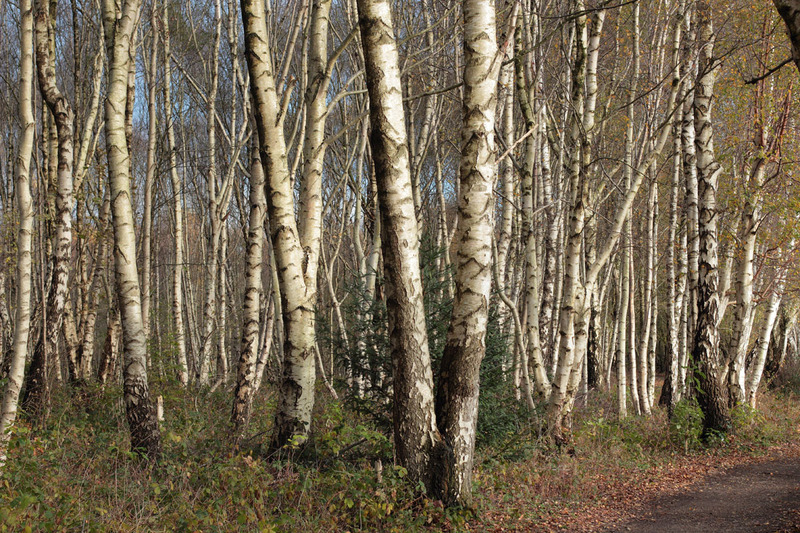 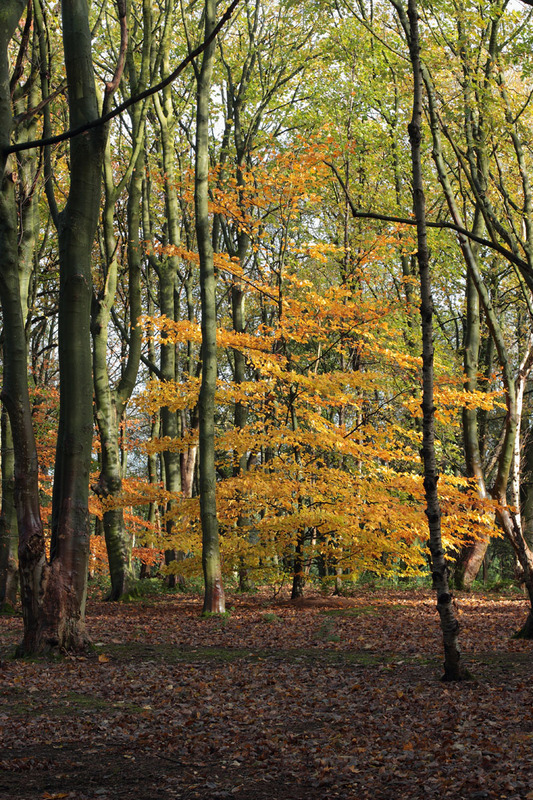 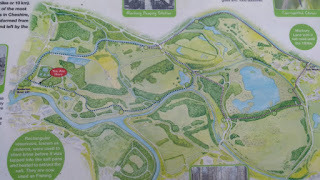 From this point we continued along the trail to Maybury Country Park and enjoyed a stroll via woodlands to the canal. 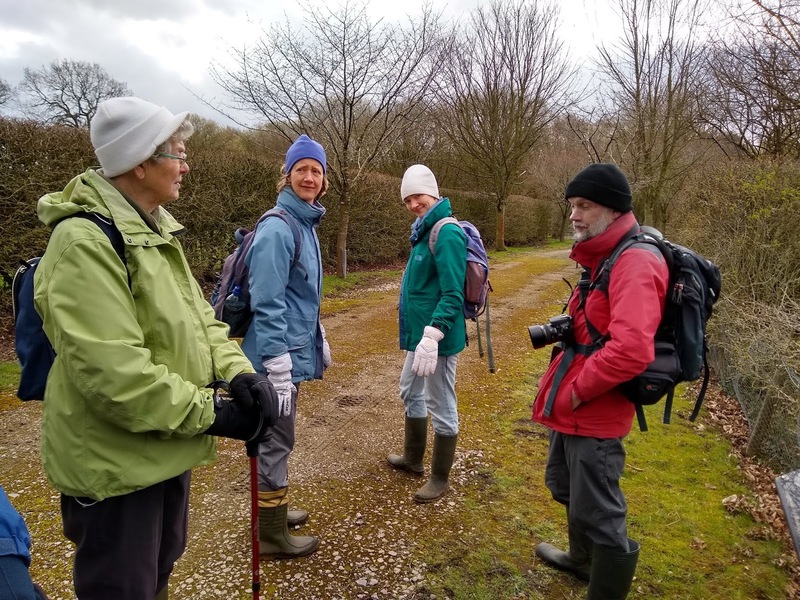 After a short walk along the tow-path we then followed the well laid out route around Neumans Flash, with its abundant bird life, to return to the starting point at the Salt Works. Lunch was taken in the Salt Barge which was the perfect end to a day in the fresh air and countryside. Seven intrepid (foolhardy?) 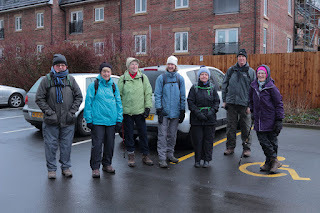 ramblers and one small dog braved the weather to go to Biddulph Moor. 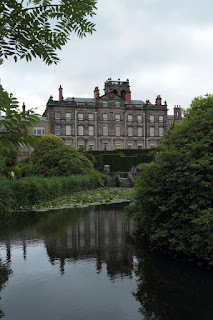 The drive there was through torrential rain and flooded roads, but the rain eased when we arrived at Biddulph Grange. 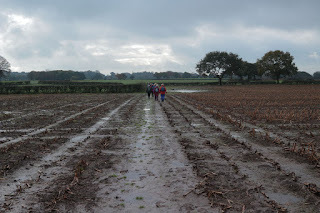 Even so we started out wading uphill though fields running with water, and the views of Cheshire from the top were rather watery. After lunch in the pub, we strolled round Biddulph Grange Gardens, which the National Trust have restored to their eccentric Victorian state. 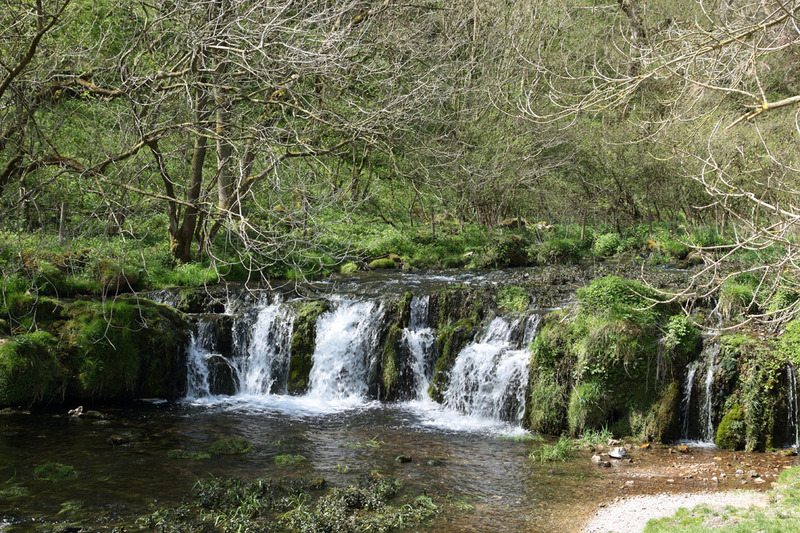 Six of us walked up Lathkill Dale from Over Haddon to Fern Dale, returning via One Ash Grange and Cales Dale. 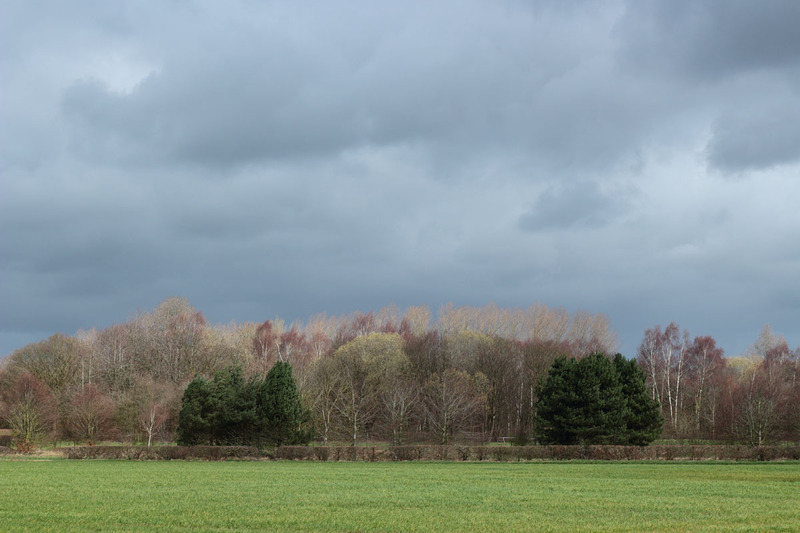 It may have looked a perfect Spring day but there was a chilly breeze. 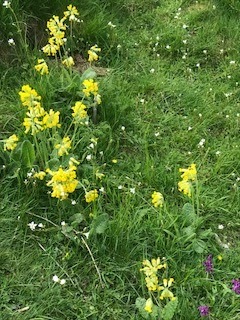 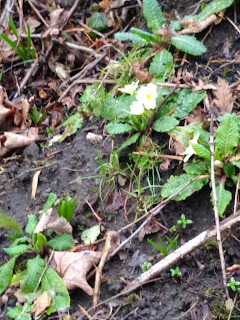 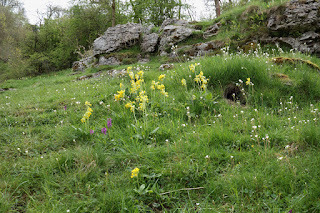 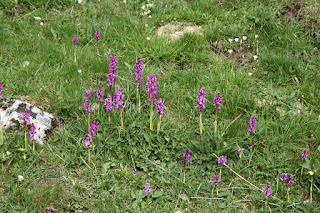 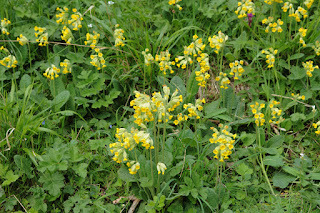 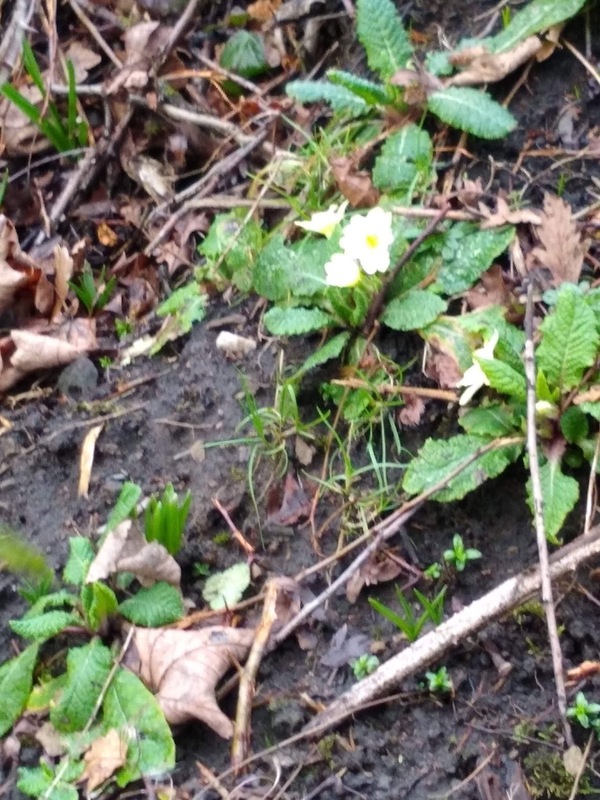 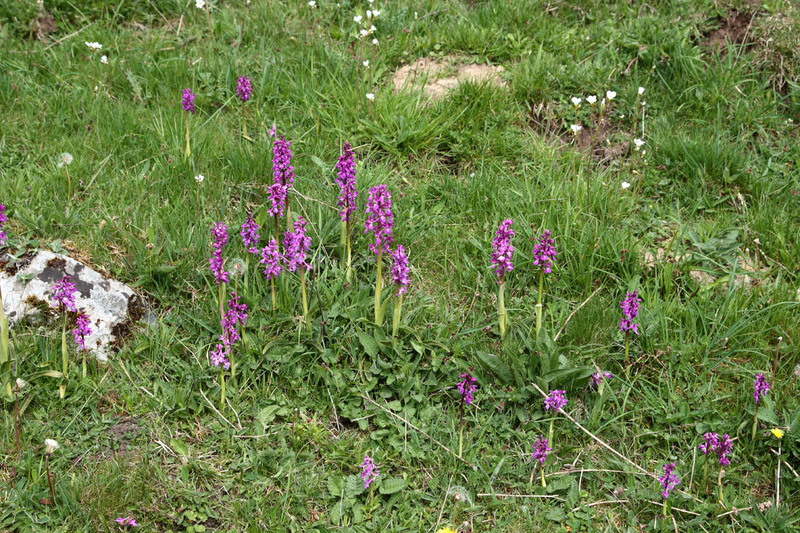 The purple orchids, saxifrage and cowslips were on full bloom but we were just to early for the Jacob’s Ladder. 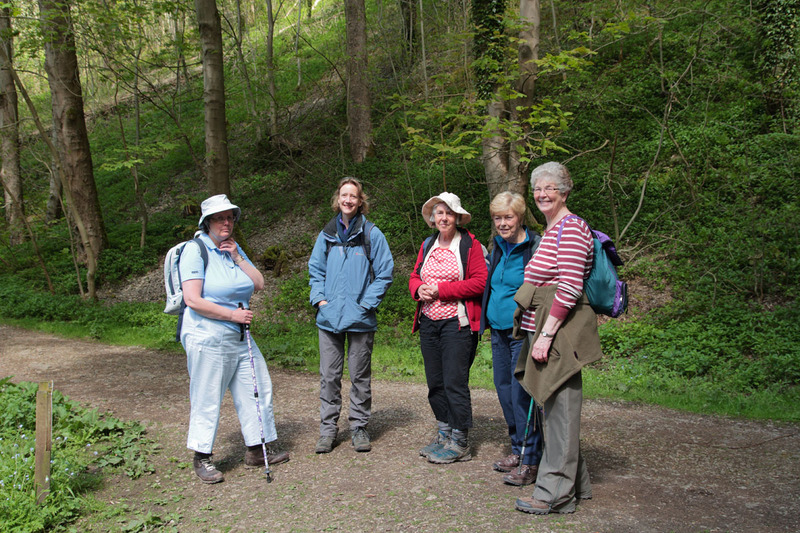 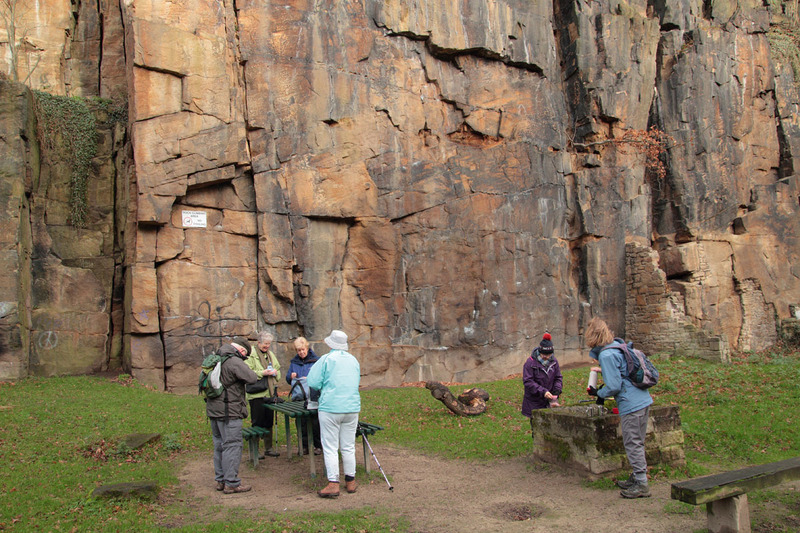 The walk finished with very welcome teas and large slices of cake in the garden overlooking the dale. On a fine sunny Saturday morning seven of our group prepare ourselves for a ramble in the Bollington area. 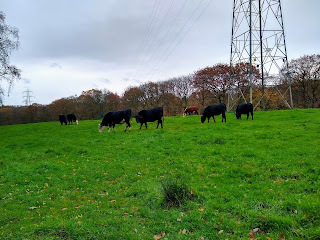 From the Rangers Office in Bollington we set off along the Middlewood Way towards Marple before turning off after about one mile to take the short ascent across fields to Styperson Lake, Here we took a short stop to view the wildlife before making the sharp steep ascent up to Long Lane. 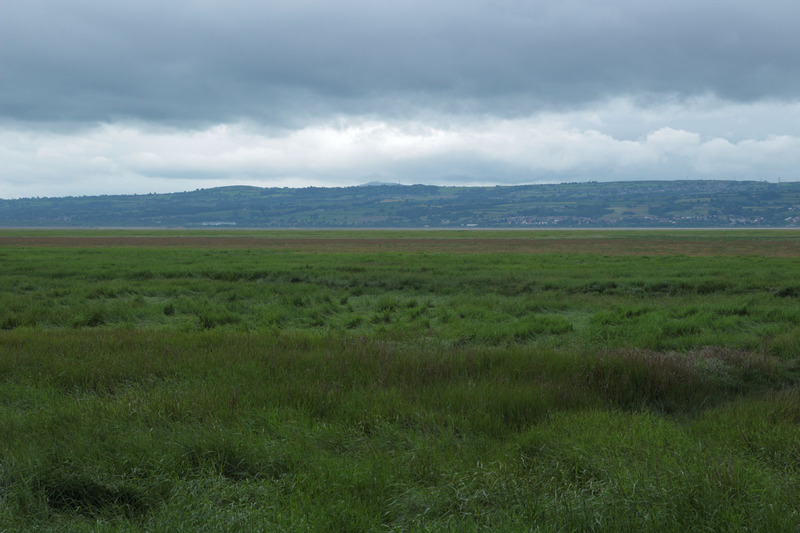 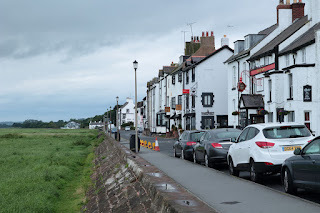 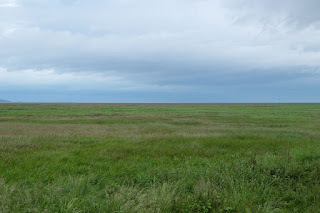 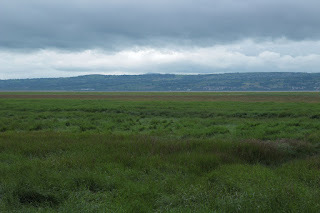 By this time it was 'Coffee Time' and we found a suitable bench where we could sit and enjoy the views across Cheshire and out to the Dee Estuary. Well rested we then made the descent across open fields to join the towpath along the Macclesfield Canal. 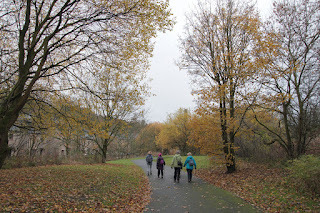 Leaving at Bollington we enjoyed a pleasant stroll through the local park and back to our start point. 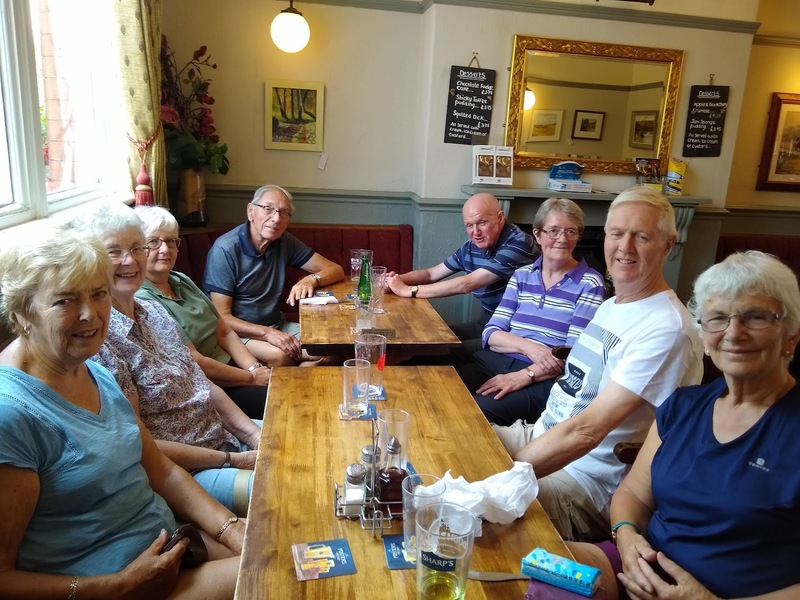 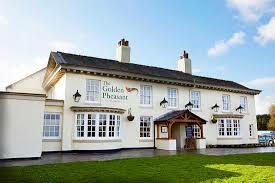 After our morning exertions we then adjourned to the Vale Inn where we all enjoyed an excellent lunch. 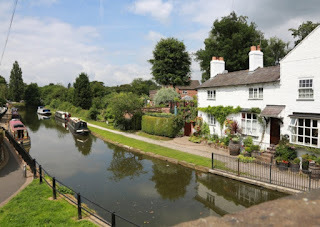 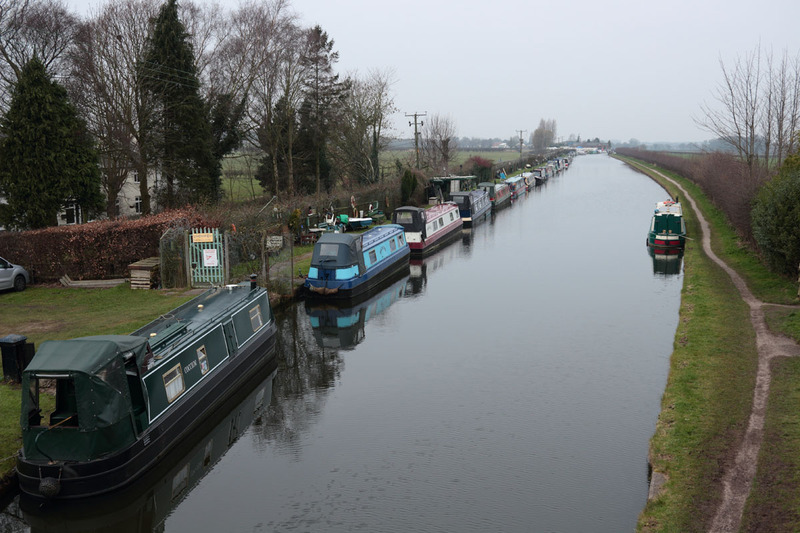 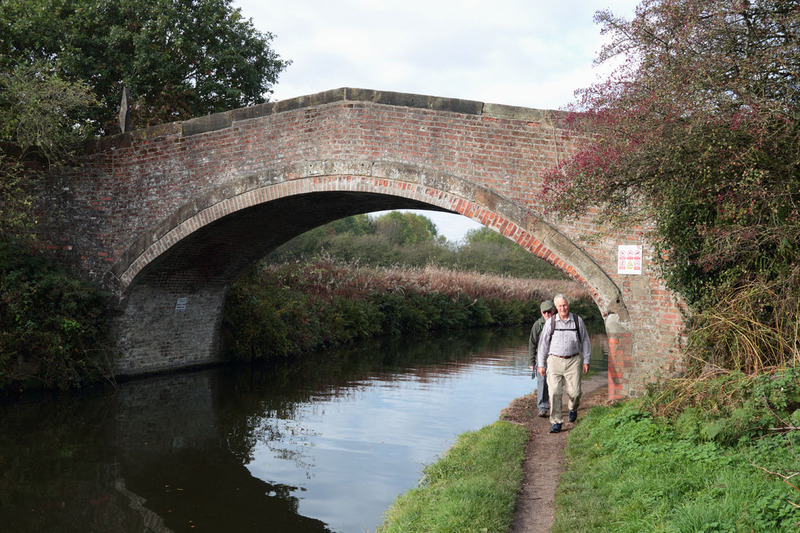 Thirteen ramblers started this 6 mile walk from the Axe & Cleaver in Dunham Town and then followed the Bridgewater Canal for about two miles heading towards Lymm. At Agden Bridge we left the canal and followed paths, through pleasant countryside to Arthill. 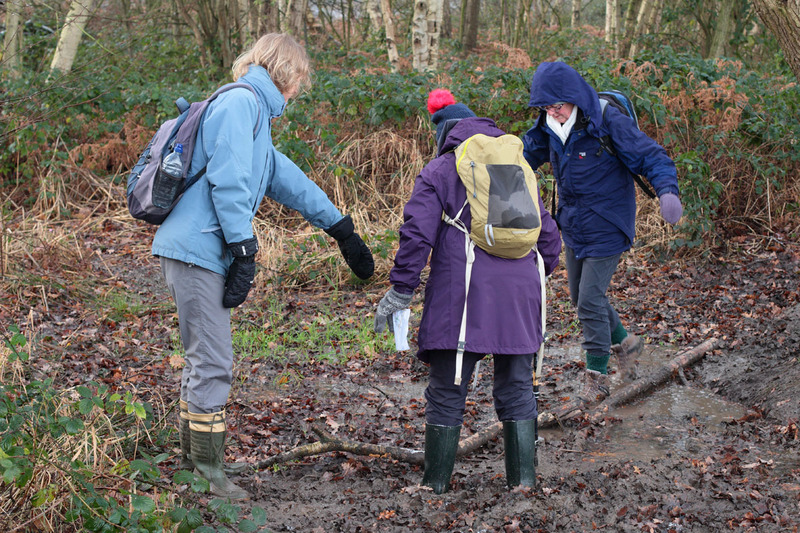 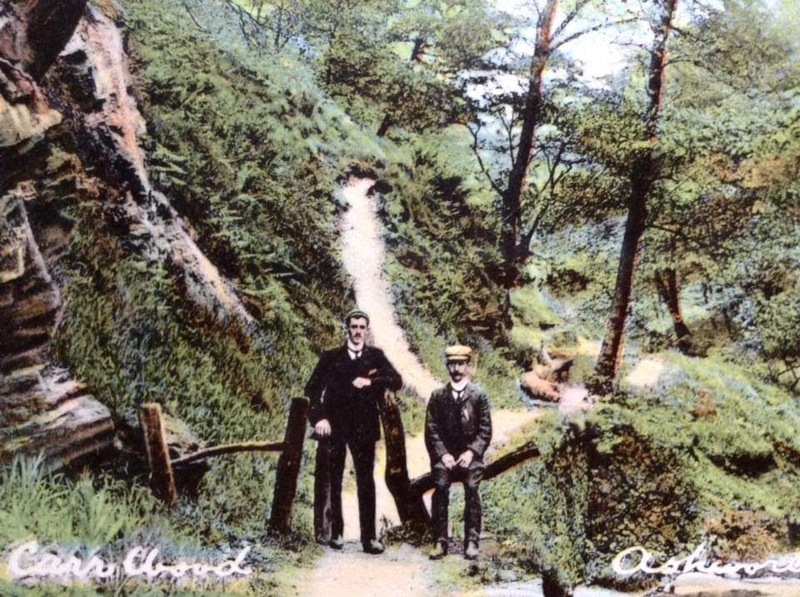 It was in this section many of us found the going difficult because of ankle deep mud around many of the stiles. 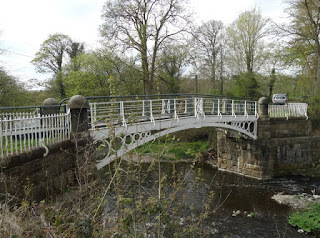 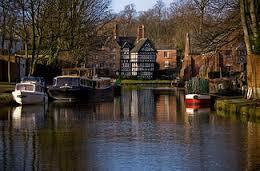 After crossing more fields we arrived in Bollington and from there entered Dunham Massey Park. 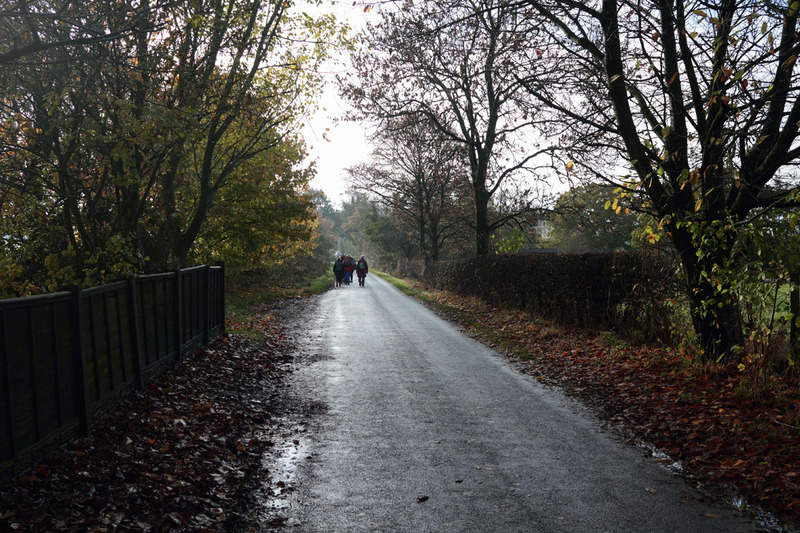 Leaving the park we then enjoyed a gentle stroll through the village back to the pub. 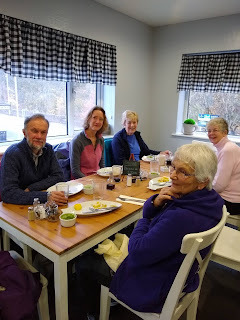 With a short break for coffee the walk took just 3 hours and we were back in time to enjoy a hearty lunch at the Axe & Cleaver. 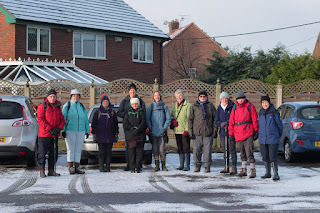 We began this walk at the Greyhound Public House in Ashley and the first part of the route was through the village. After passing the church of St Elizabeth we joined a farm track heading north which took us up to Ashley Hall and farm and eventually onto the Ashley/Hale Road. 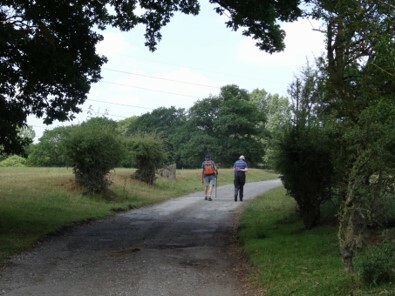 From here we joined another farm track and crossed open countryside to Jenkins farm. 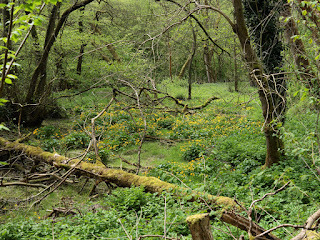 It was along this path we found a picnic bench under an old oak tree where we stopped for our coffee break. 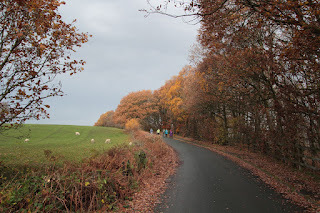 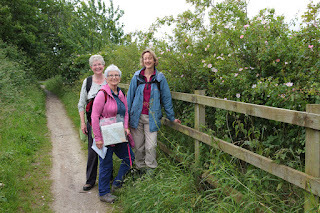 The next part of the walk was across open fields towards the M56 Motorway. We had been warned that it would be muddy along this stretch but it was far worse than anticipated. After crossing the motorway the path was so muddy to make it impassable and we consulted the map to seek an alternative route.Fortunately there was one available which took us down to Bollin Brook and then back to Ashley which made the walk slightly longer than expected but we were still back at the Pub in good time to enjoy an excellent lunch. 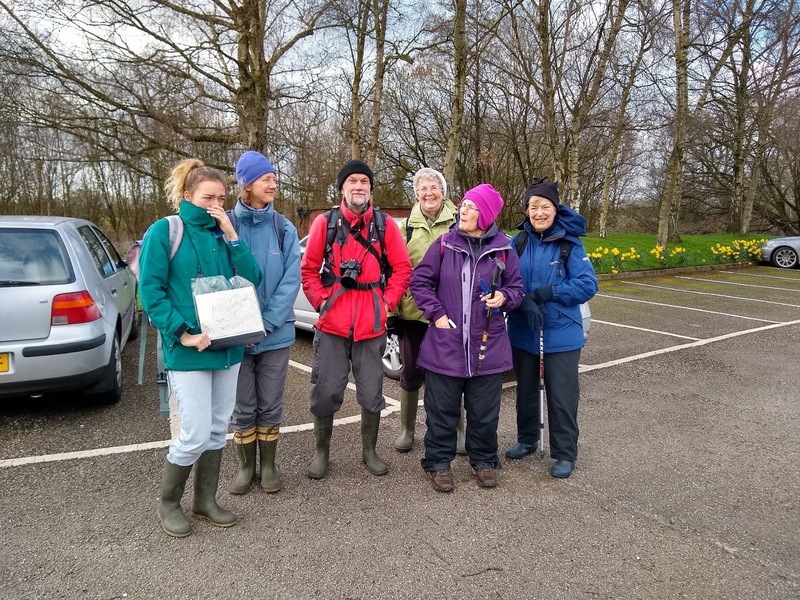 A good turn out for February!